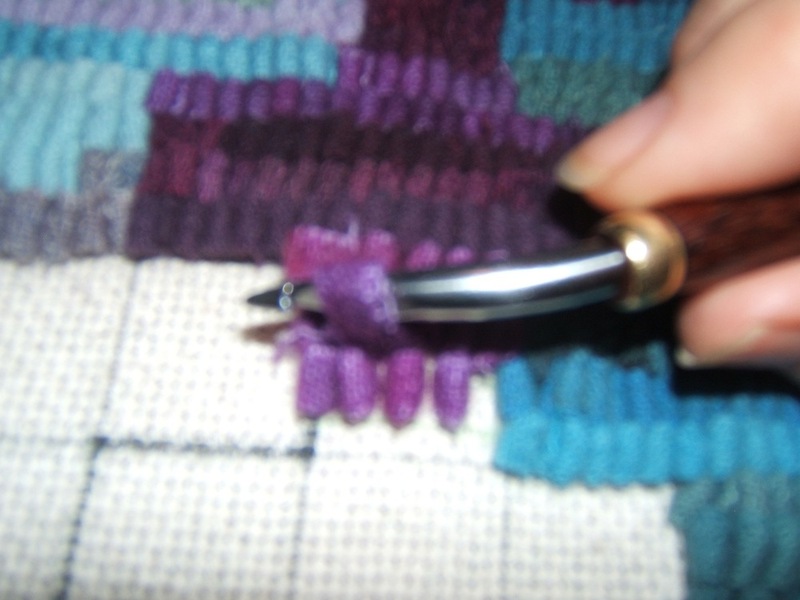 I had hoped to finish hooking Matrix Zippers last night, but I ran out of steam. 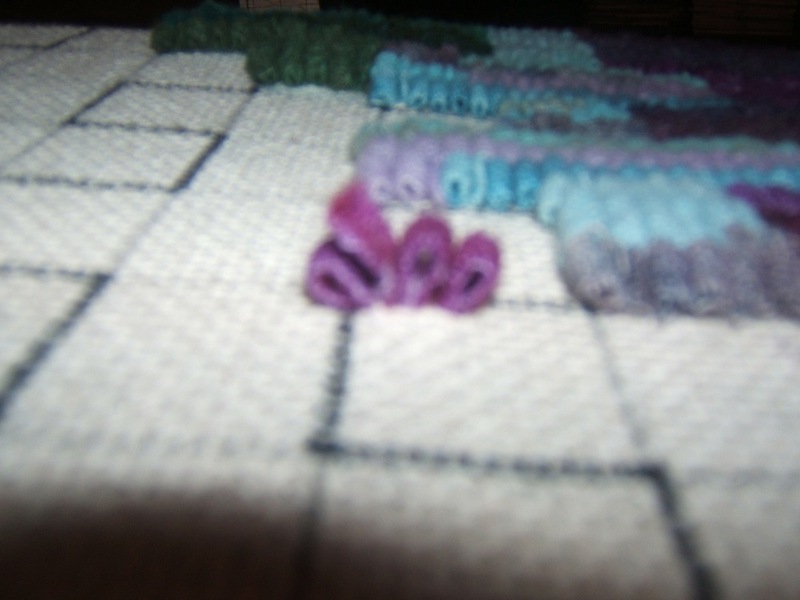 I had to cut more wool and that took longer to do than I realized it would. 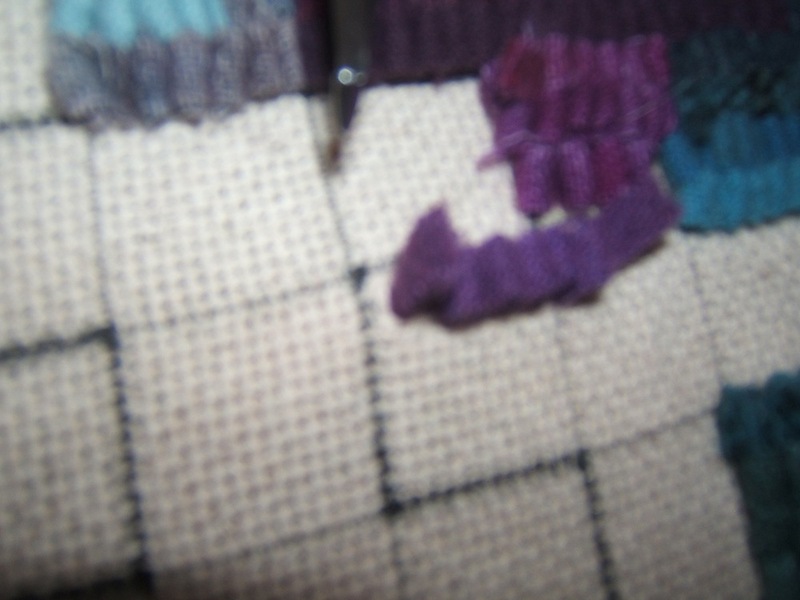 (I can only cut 2 strips at a time )…..but it is nearly done….just part of one zipper, and the ‘half zipper at the end ‘ to go. 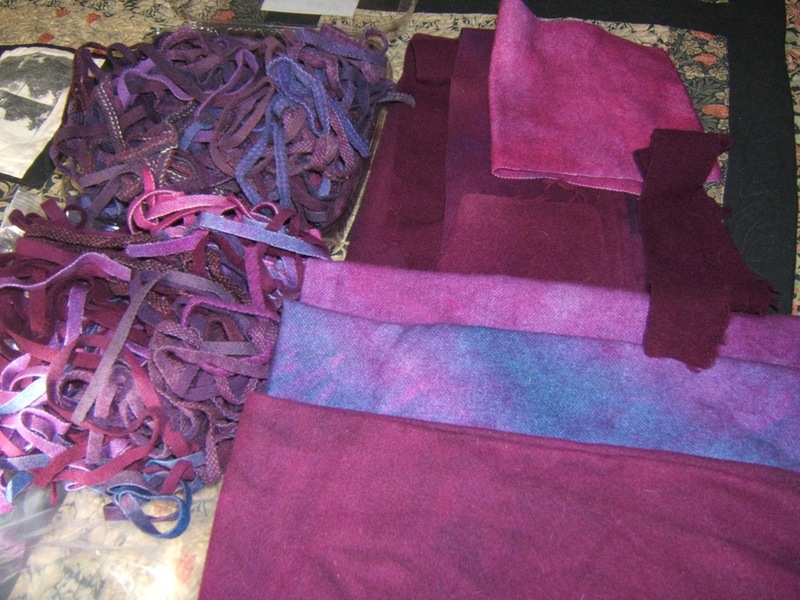 Today I have been once more having fun with the dye pot. When I was at R.U.G. 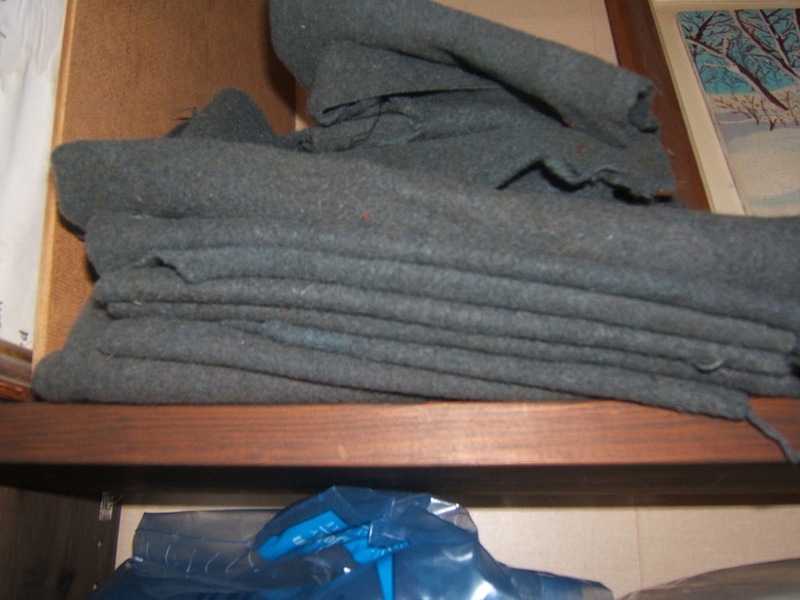 a couple of weeks ago, I picked up a camel hair coat that had been taken apart and over dyed grey. 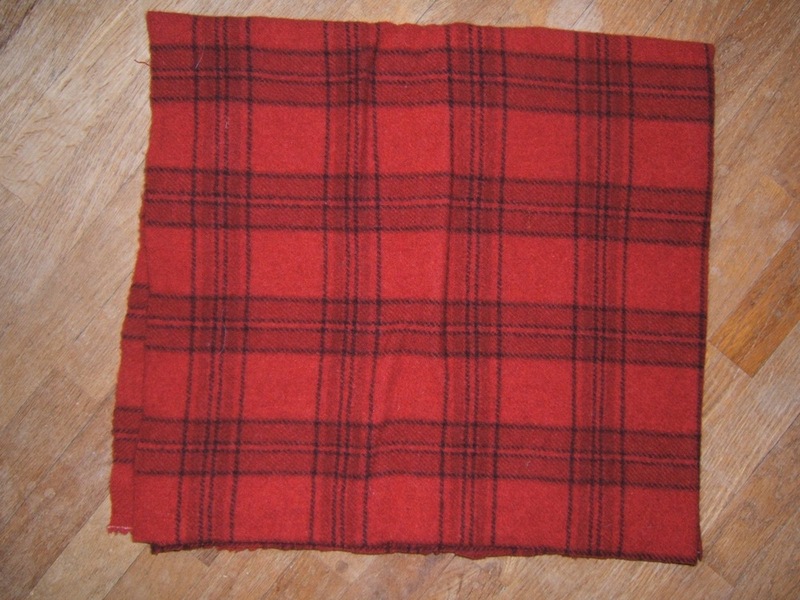 I didn’t have any specific use for it in mind, but it was beautiful wool, very reasonable, and I knew it would eventually come in handy. 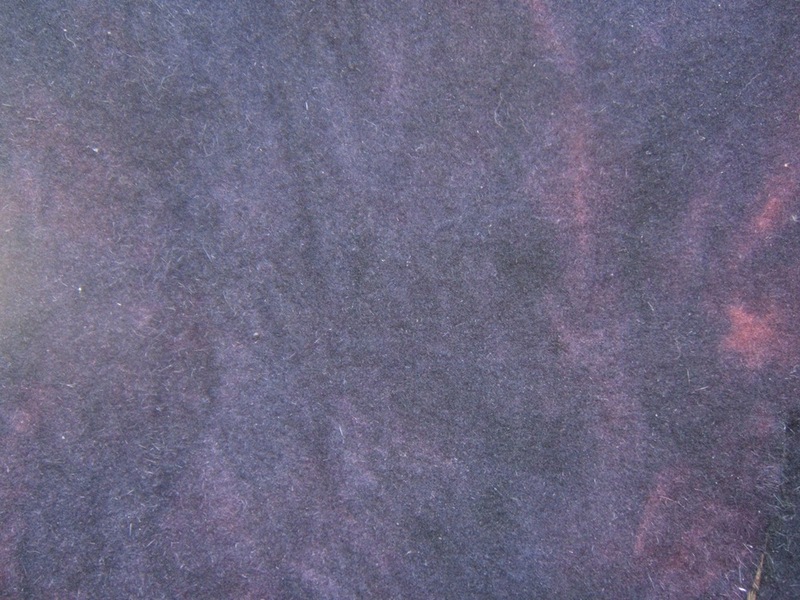 I’ve been trying to anticipate what wool I’d need while at Trent, and realized I’ll need a very dark outlining colour. 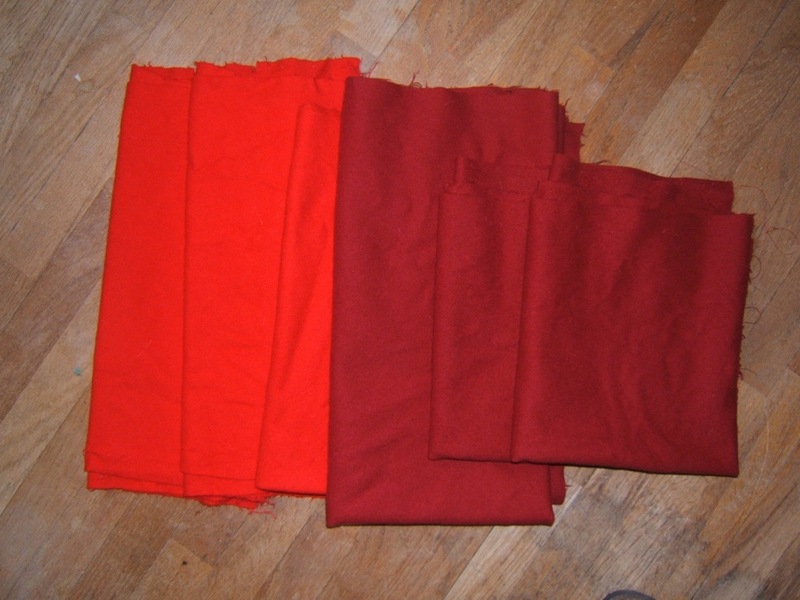 I cut some of the camel hair in a 4 cut, and it cuts beautifully…so I set out to over dye some of it darker. 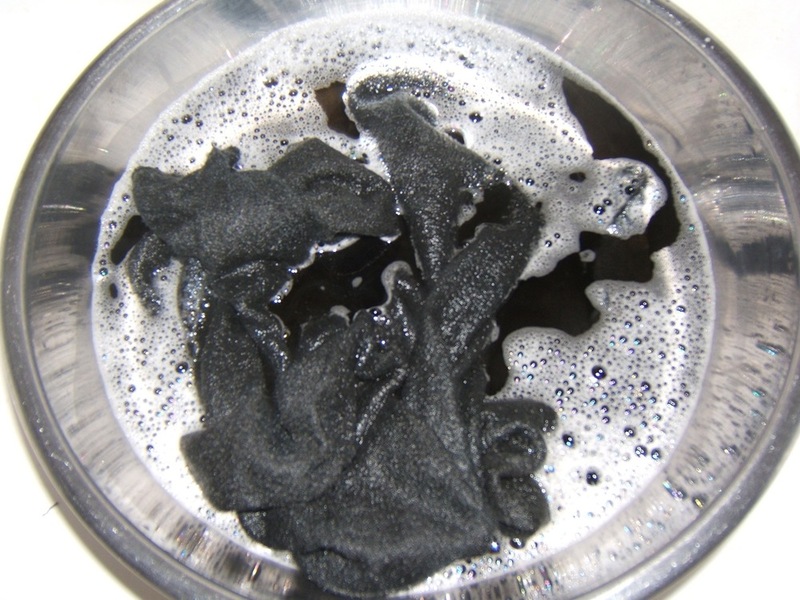 I was surprised at how unstable that grey dye was….when I soaked it….the water was black! 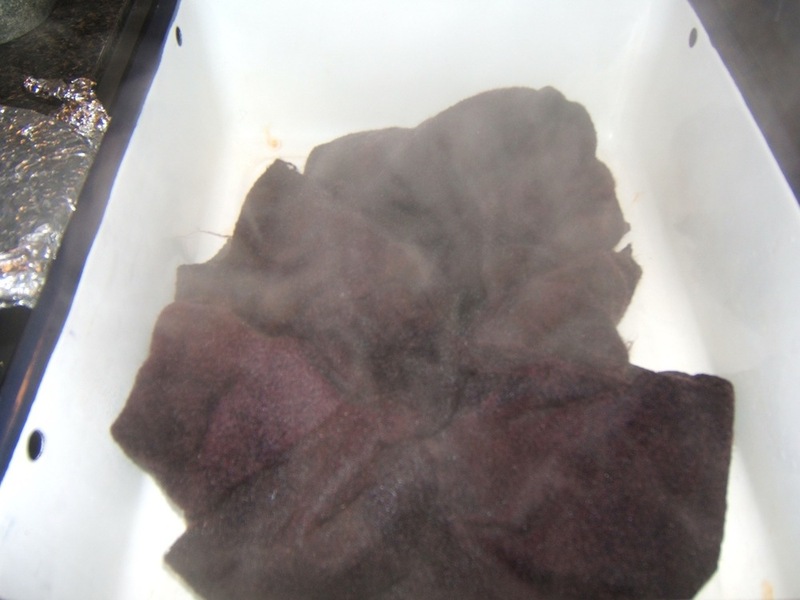 Actually rather than black to outline with, I want a very dark red…so I tried 1/4 tsp mahogany in 1 CBW, and added the grey wool and vinegar. It wasn’t nearly as dark as I wanted it…so I over dyed that with 1/4 tsp navy in 1 CBW. 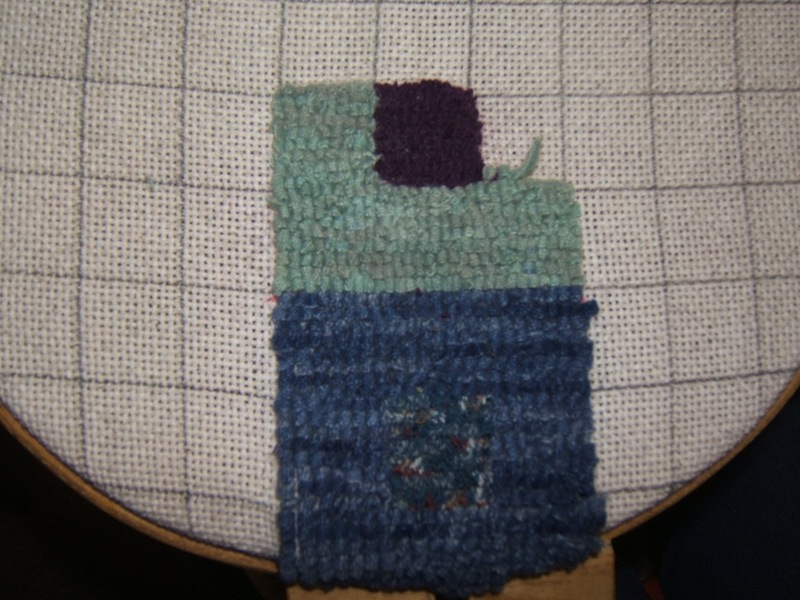 (I was being reckless since I had lots of the wool) I tried again with a different piece of grey. 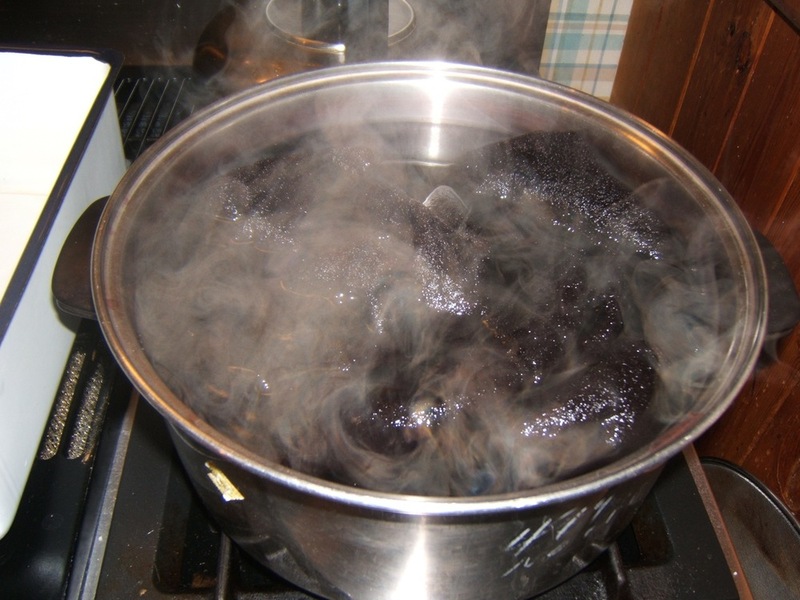 This time I used 1/4 tsp mahogany in 1CBW and 1/4 tsp black in 1 CBW….but I only added 1/2 cup of the black solution to the pot. The results on the line..( you can see here how dark they really are).I’ll have to bring them in before Ray starts the fire in the wood barbeque…finally a beautiful day and…..yummy hamburgers for dinner. 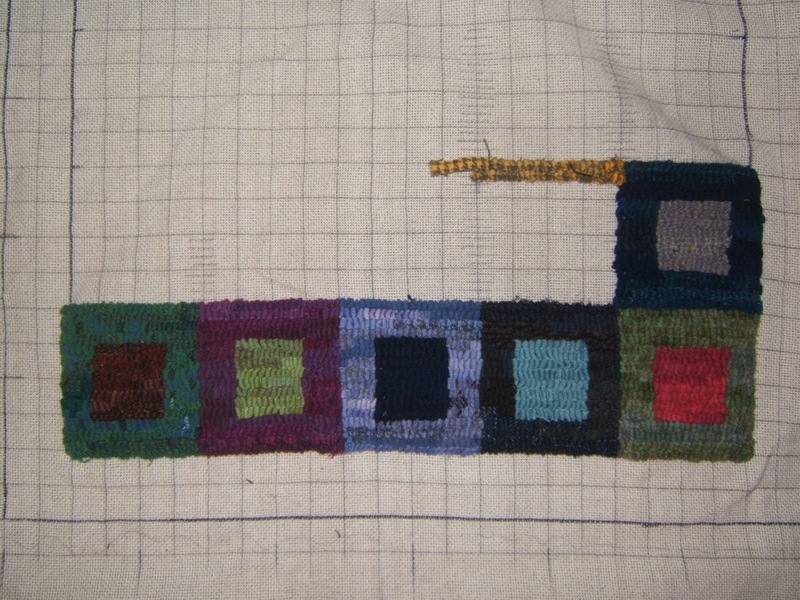 “Zippers” is progressing quite quickly….it is very easy, straight line hooking ….fun to do while watching TV. 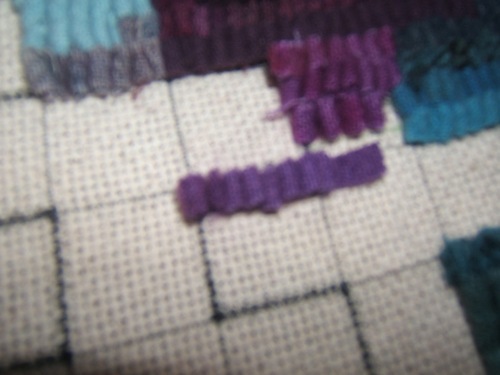 I’m very pleased with how the colours have turned out, (these are sure my colours)., and I’m learning lots about combining colours and the effect of using lots of textures. 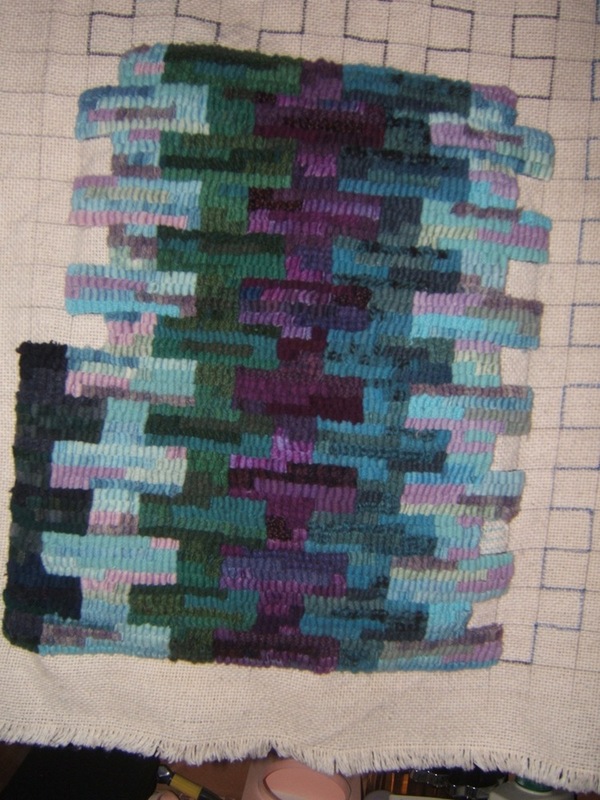 With the whole thing being done on a 1″ grid…there are lots of changes of colour, and lots of ends to deal with. 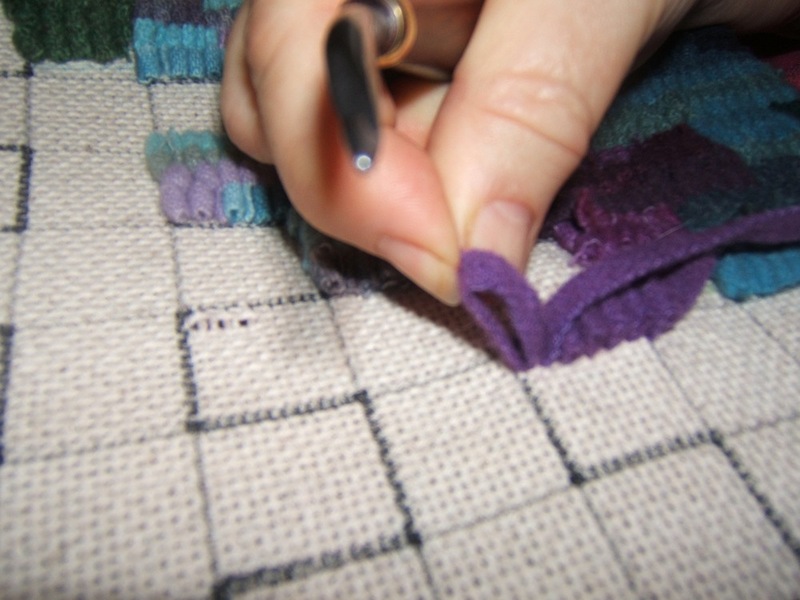 While I was at the matrix workshop with Jennifer Manuel a couple of weeks ago, she admitted that one of her personal ‘bugs’ is having 2 ends together. 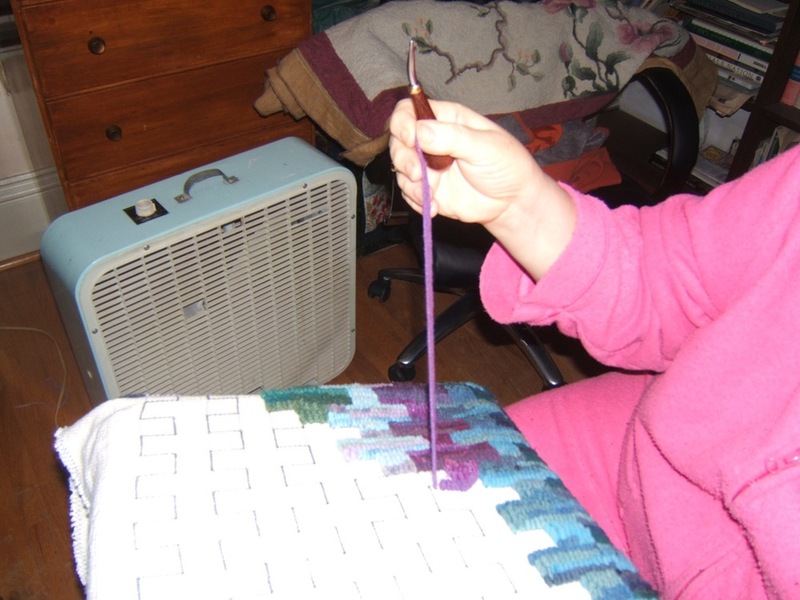 (I must admit it’s never really bothered me…I always thought it was just a part of hooking)…..But dealing with them has certainly caused me some problems along the way. Jenn explained the three methods she uses to deal with ends. 1. Perhaps the simplest way to end a row without the tail , is just to pull the end up sideways in the ditch between the rows. 2. I learned how to start a row without an exposed tail by watching Jean Chabot while she was hooking. (Amazing what you learn just watching over someone’s shoulder!) Start by pulling up the end in the second hole, rather than where you want to row to begin. 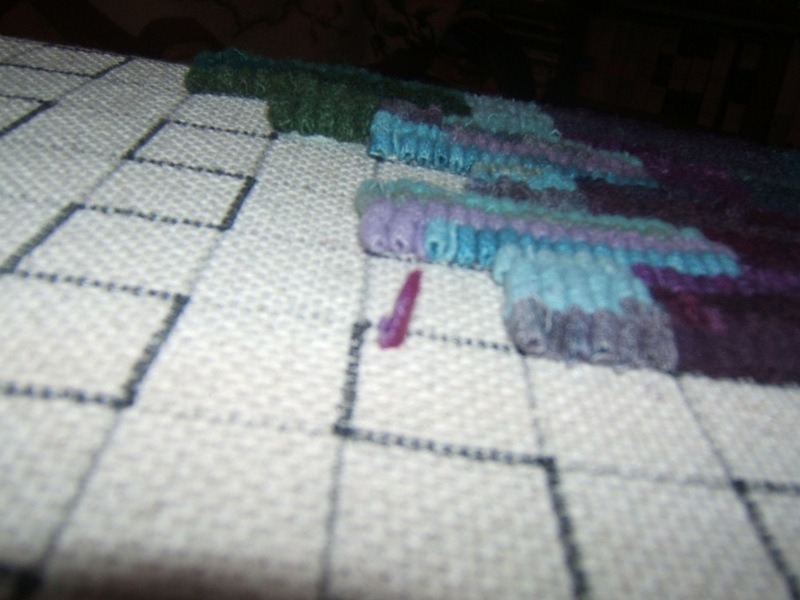 Then go under the tail and pull the next loop to proceed with the row. Stop hooking with room left for 2 loops. 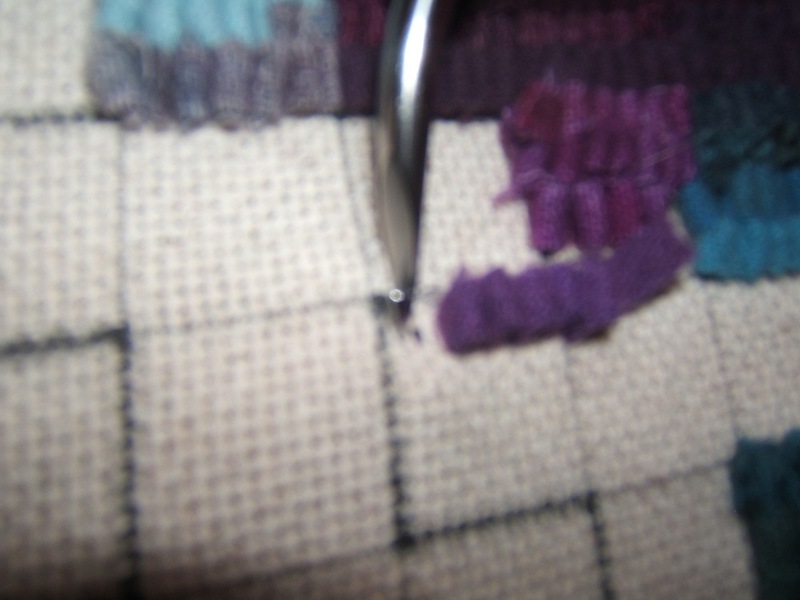 Then pull the tail again gently to even the loop size with the other loops of your hooking, and snip the tail. One of the best things about hooking with a group….whether it’s at a course, a meeting or a camp…is all the little tips which we pick up from other hookers, that make our hooking easier/better/lovelier. 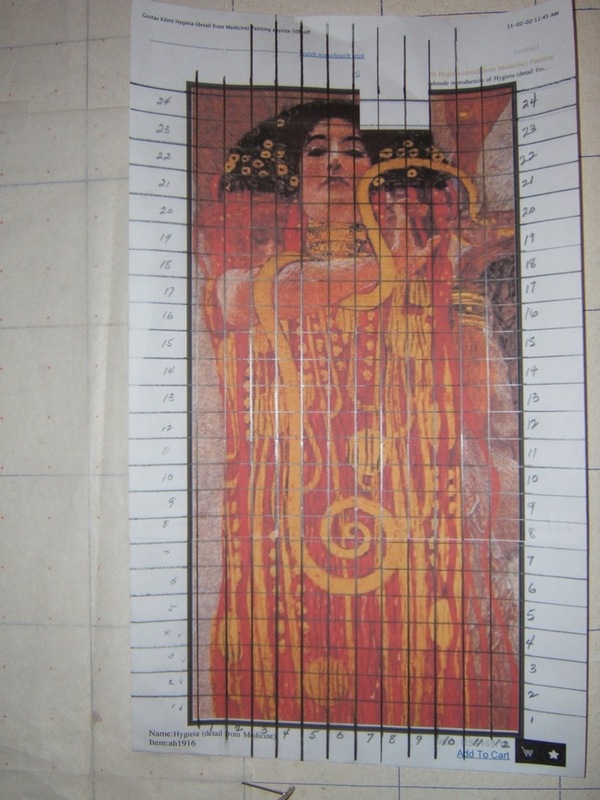 I’ve spent some time just staring at the picture of Hygieia, and trying to analize the colours in her skin…. Oh how I wish I was an artist….sigh…my son Mathieu is so good at this….he can immediately see the variety of tones and shades…(but alas he isn’t home)….so it’s up to me. 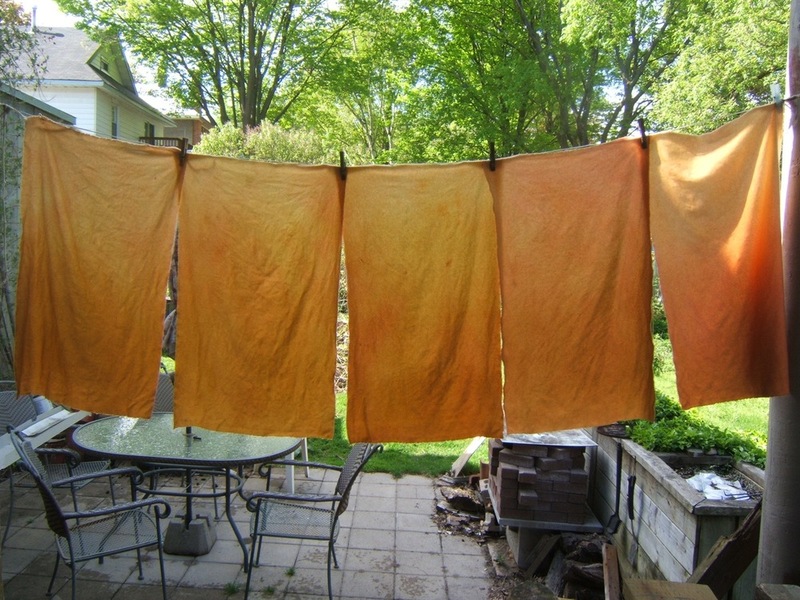 I made up four colour baths…1/16th dye to 1 CBW in mustard, pink sand, maple sugar, and mahogany. 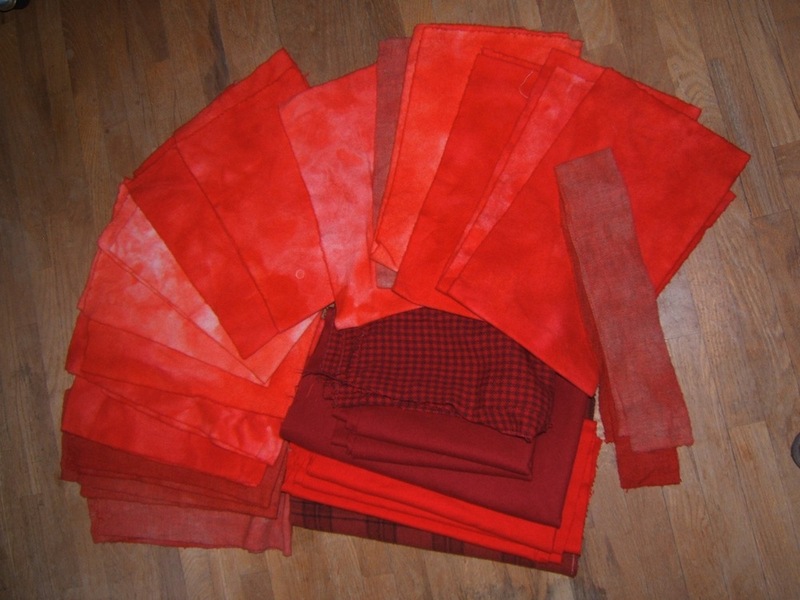 Using paper towels, I spooned on the dye baths in various combinations to see if it came anywhere near what I was looking for. 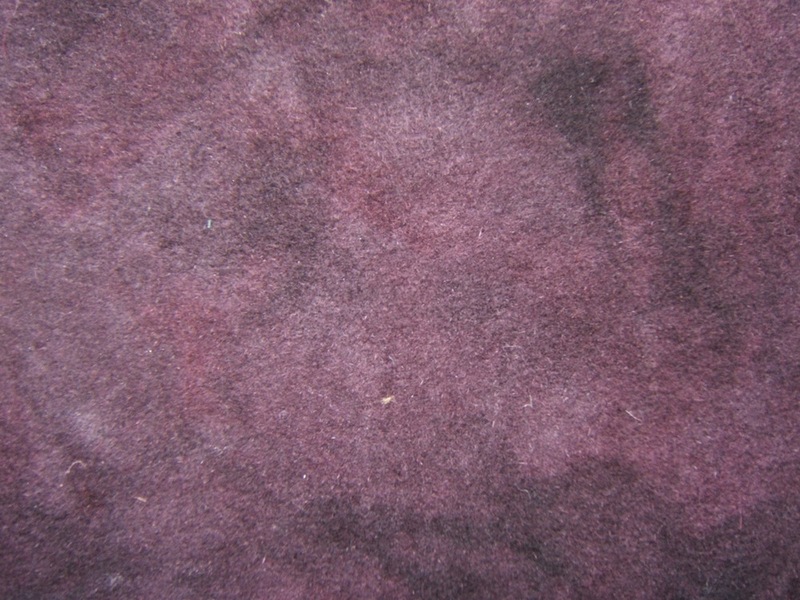 I discarded the idea of the mahogany right away as it was much too purple-ee. The maple sugar seemed a good base, and the pink sand gave it a bit of pink and the mustard some yellow highlights. 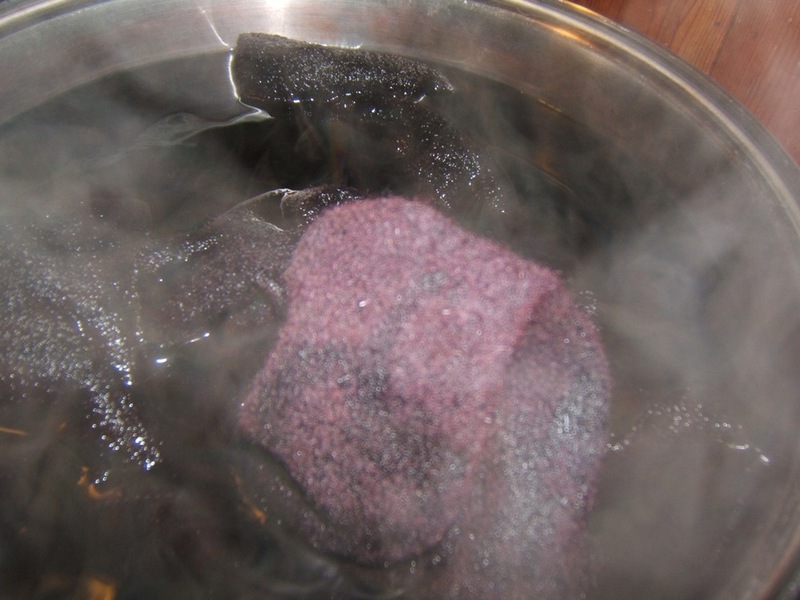 I finally settled on 1/2 cup maple sugar, plus 1/2 cup pink sand, and 1/4 cup mustard in my pot of water. 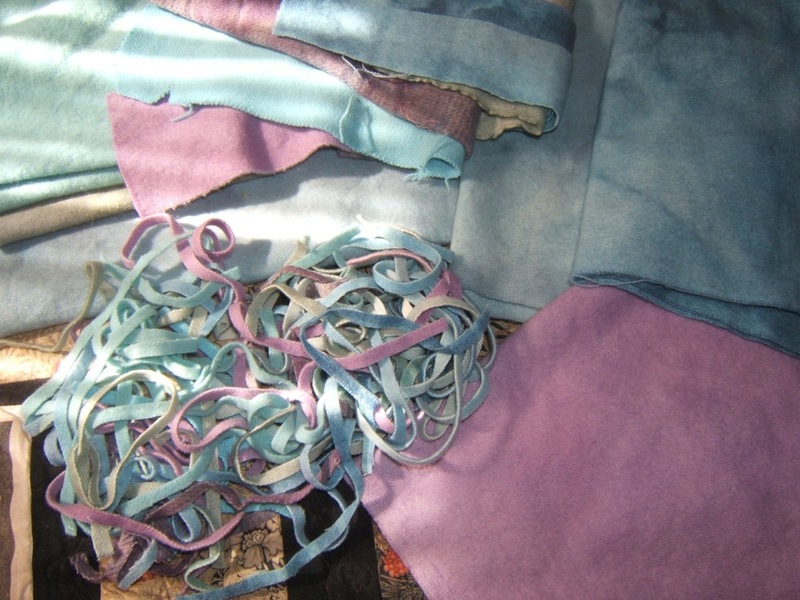 I dip dyed 1/4 yd piece of natural Door wool. 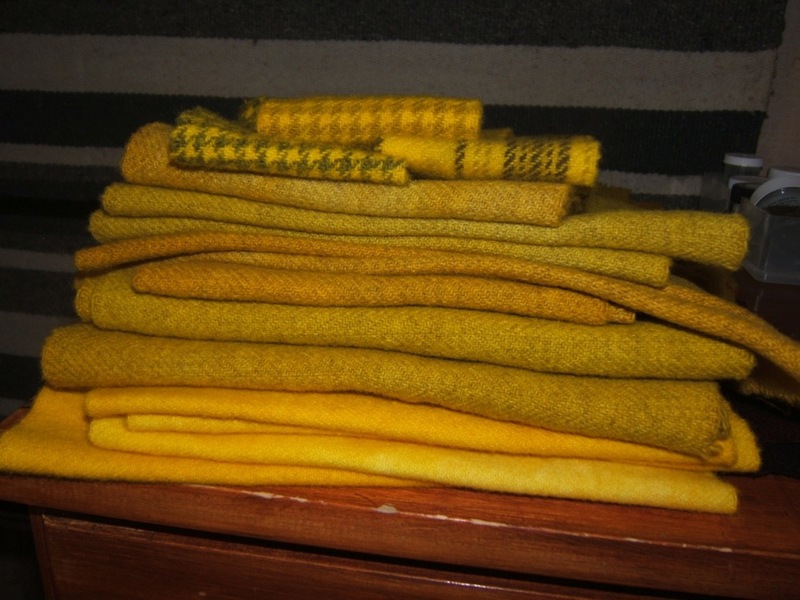 That was not too bad….but still a bit too yellow. I ended up making a bath of 1/16 tsp. paprika in 1 CBW, added 4 tbsp.of this to the pot and dip dyed again. 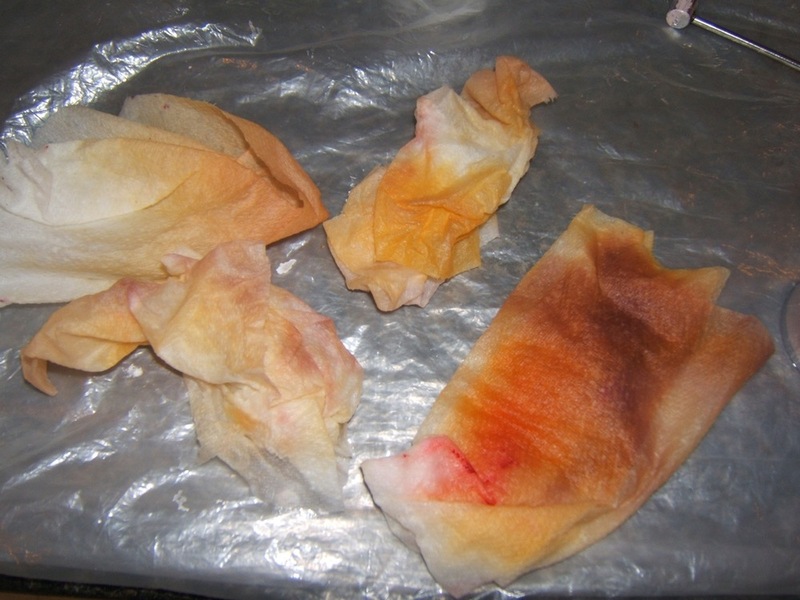 That piece is a bit too pink (although it can certainly be used) so the other pieces, I did the second dip dyeing with only 2 tbsps of the Paprika. 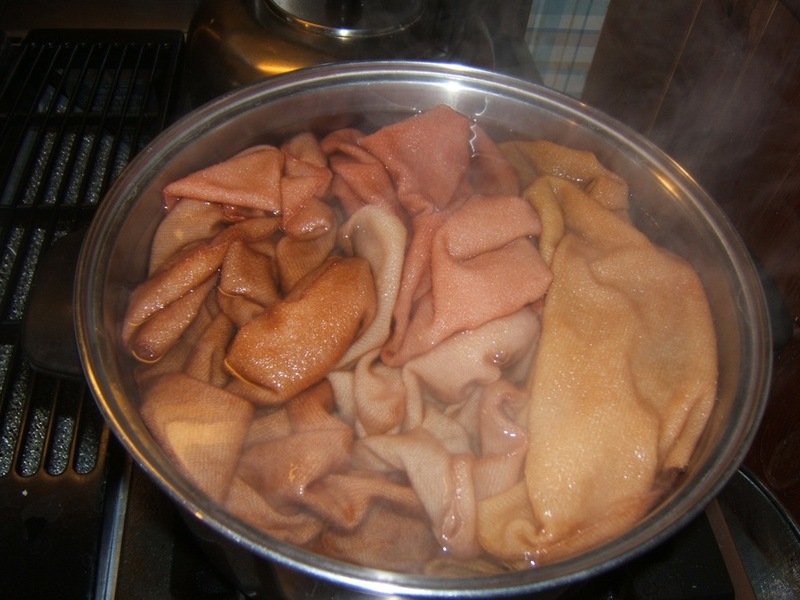 I returned all the pieces to the pot, added more vinegar and simmered for 1 hour. 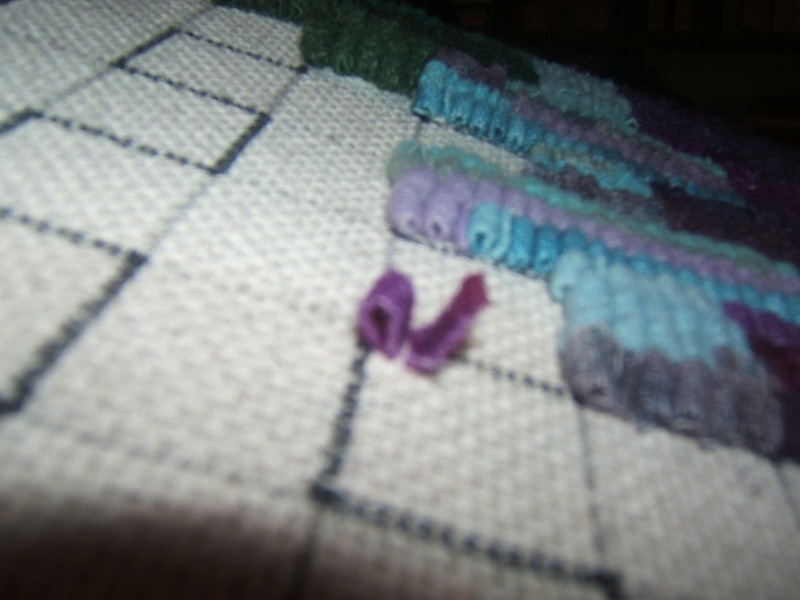 In all I did 5…1/4 yd pieces. 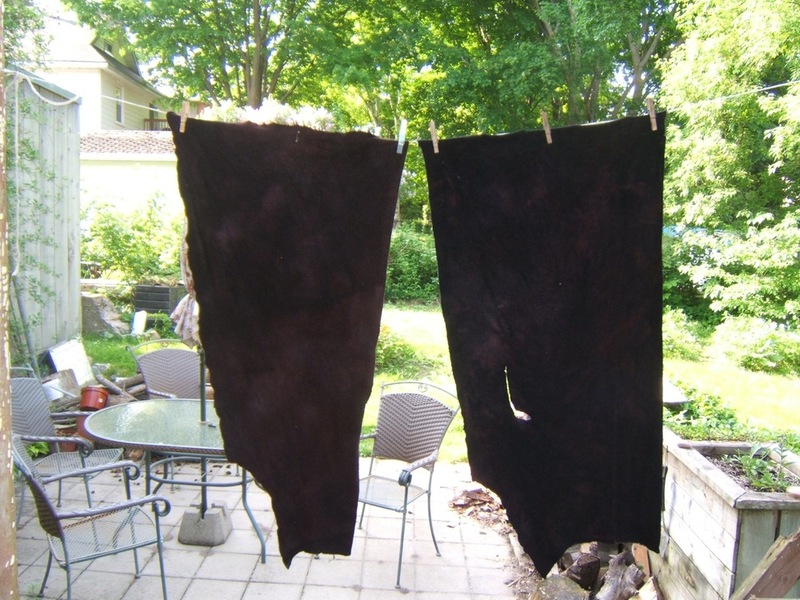 It was so nice to get them outside to dry. 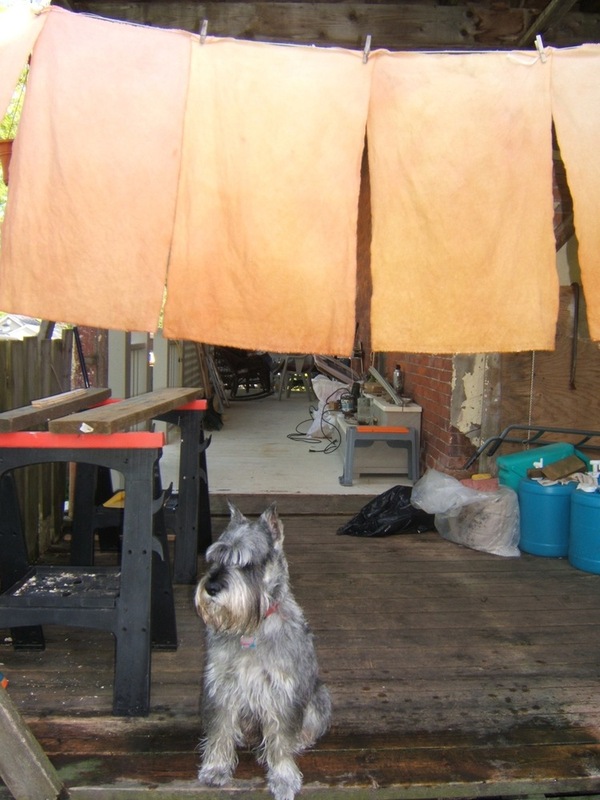 My standard schnauzer Baxter thought I was taking his picture…and posed so expectantly that I had to include him too. ….and until I go to Trent….they look pretty on the shelf. 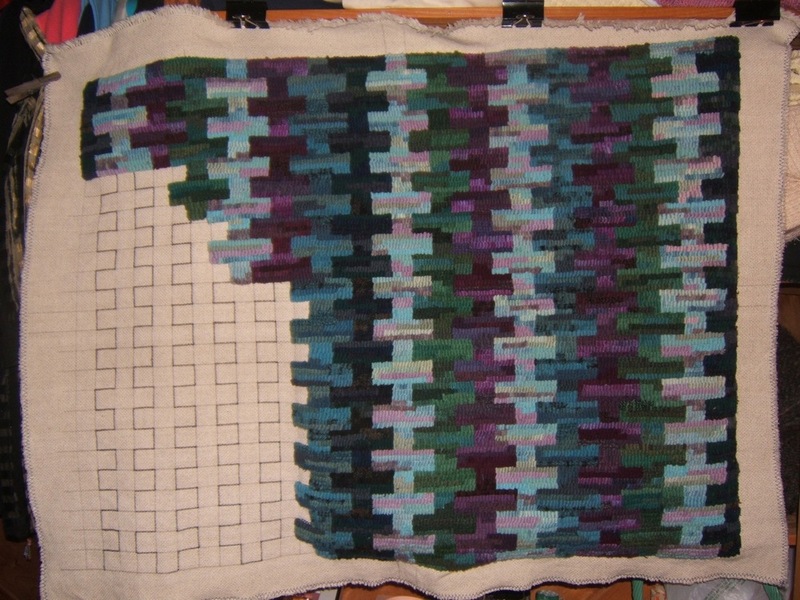 I don’t plan on starting Hygieia until I’m at Trent….which is still 6 weeks away, but she is 3 feet by 6 feet….so I’ll need lots of wool. … with my new thoughts on colour after the workshop with Jennifer Manuell, and a new dyeing technique at my finger tips, I’ve decided to revisit my wool for that project, and think about additional variety and texture. When I was at R.U.G. 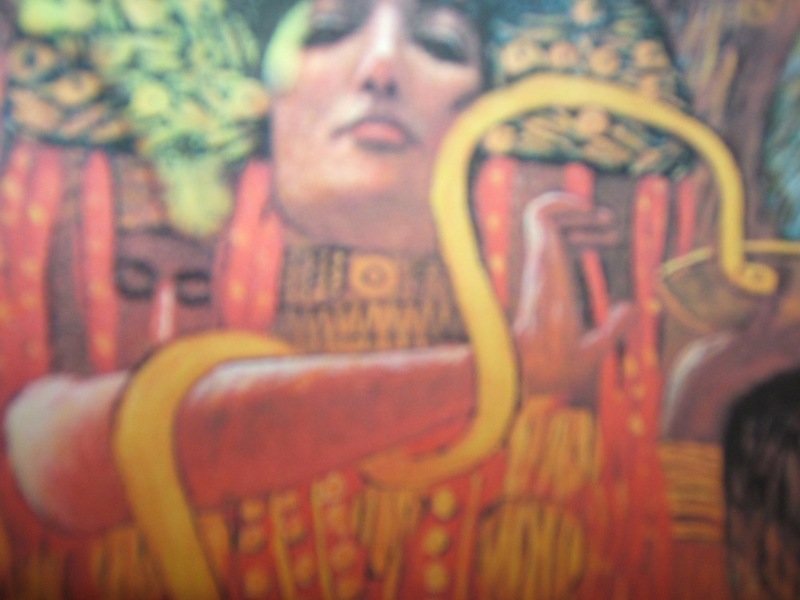 on Saturday, I went on a wonderful shopping spree….with Hygieia in mind. 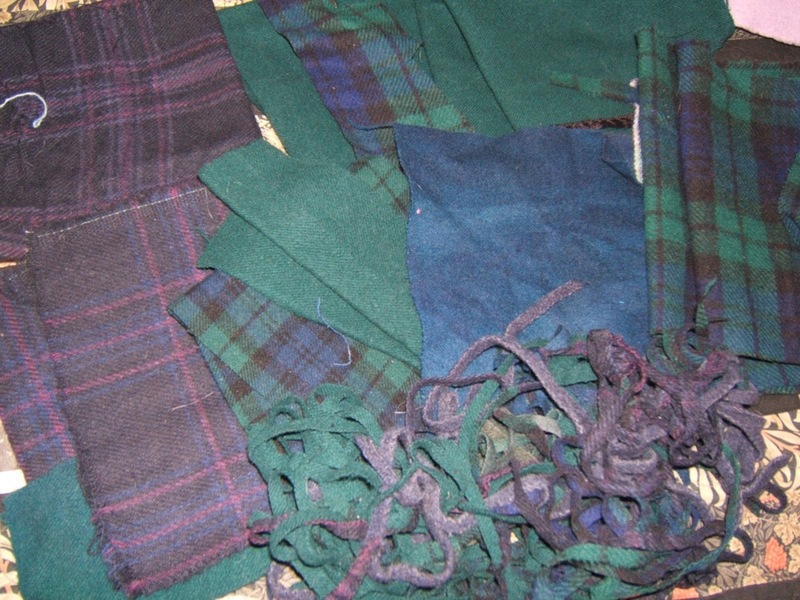 And a number of plaids and checks, that I thought were suitable for overdyeing. 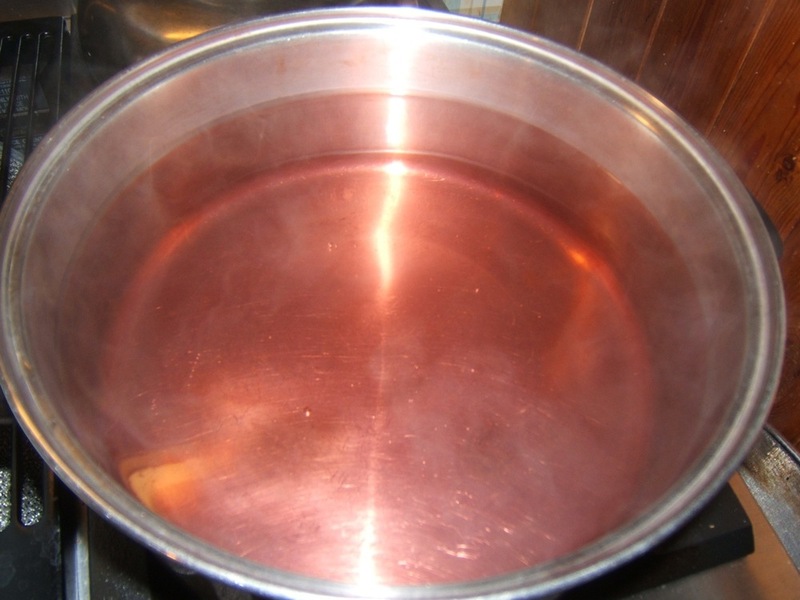 I was in a rush to use the stove for making dinner…and didn’t let the water clear completely…. 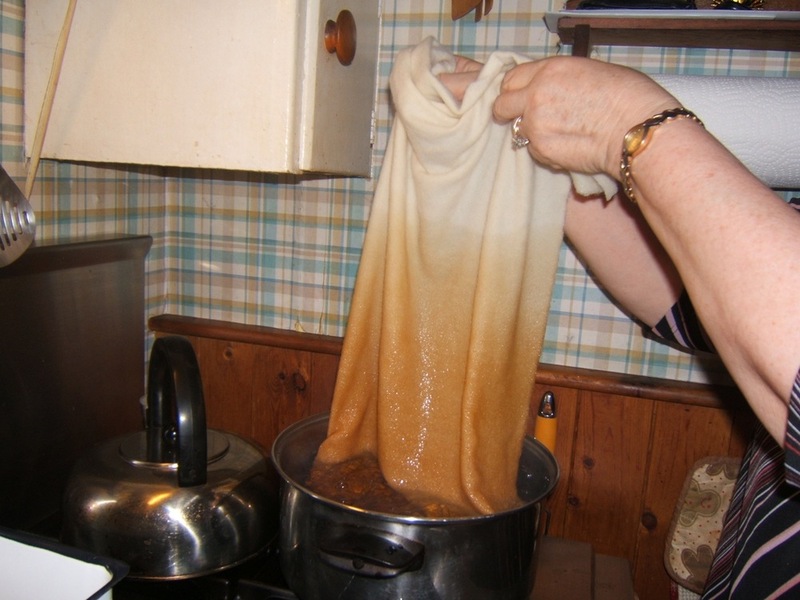 (I DO know better) and so the oatmeal is a bit greenish…..and will hit the dye pot again. 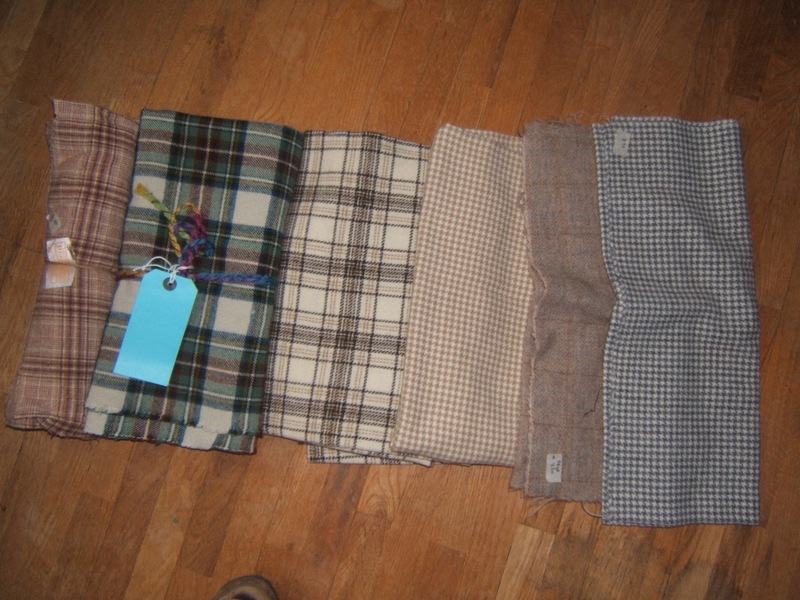 I think the glengarry and black houndstooth are too stark….but the brown houndstooth I think may be useful in the snake. 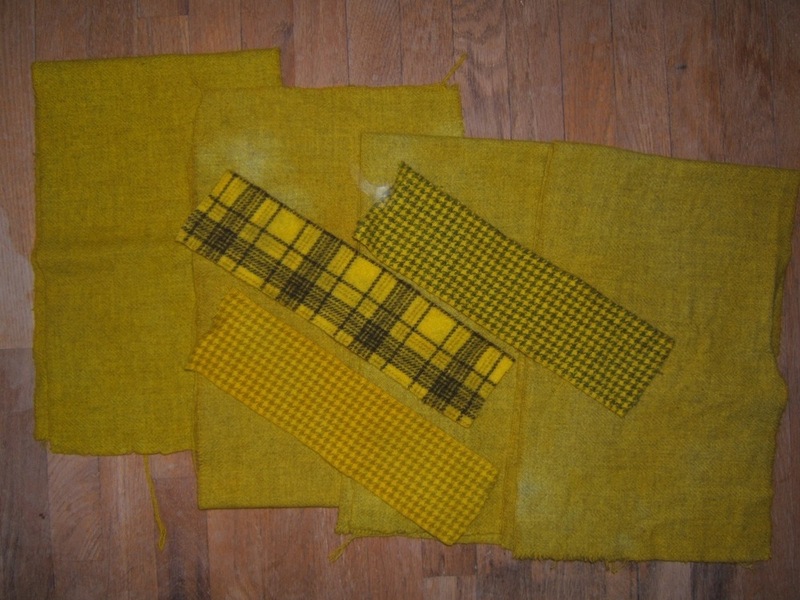 …and these are the yellows. 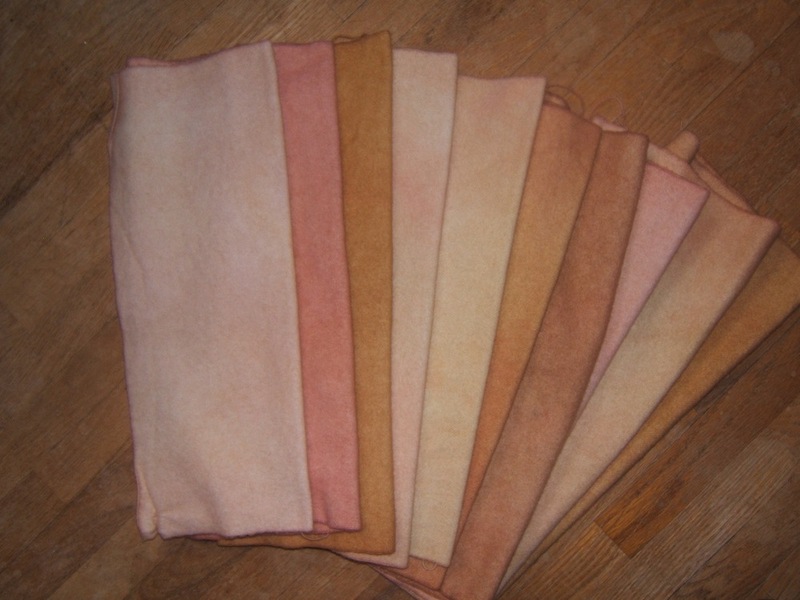 My next job will be to try and dye some wool for the flesh….which goes from very light to very dark and has a sort of terra cotta tone to it….I”m thinking of ‘pink sand’ and ‘mustard’ as a base for it……or??? Some experimenting is on the agenda. 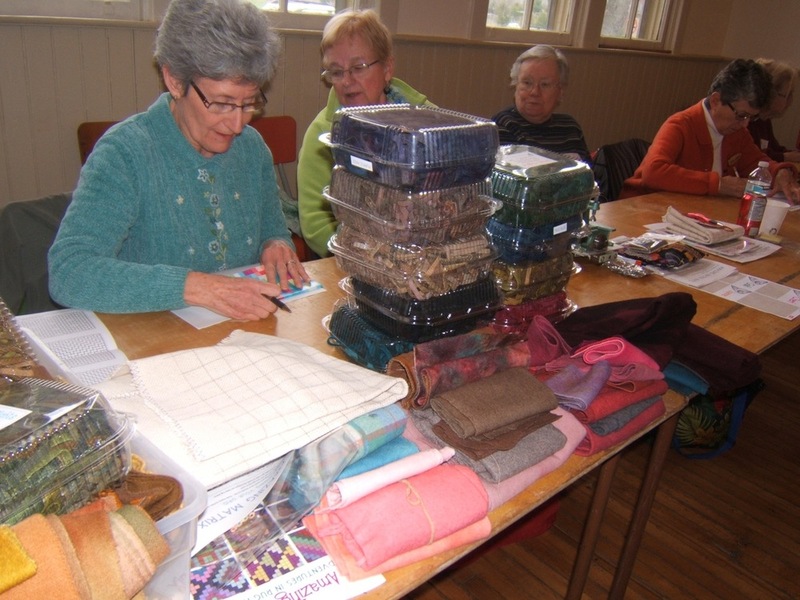 At the Sunshine meeting Tuesday it was great to see how everyone was beginning their matrix rug. 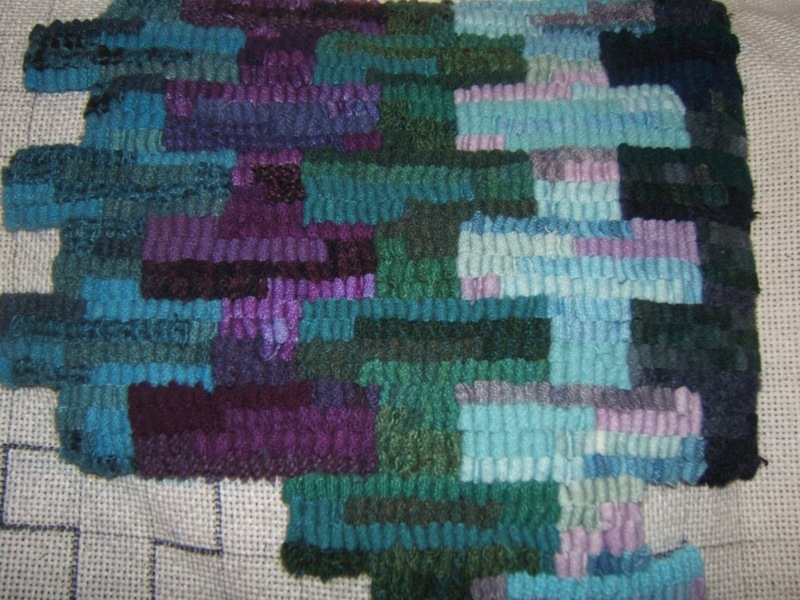 Quite a variety of patterns were chosen, and of course the best part for me was seeing all the variety of colour palettes. 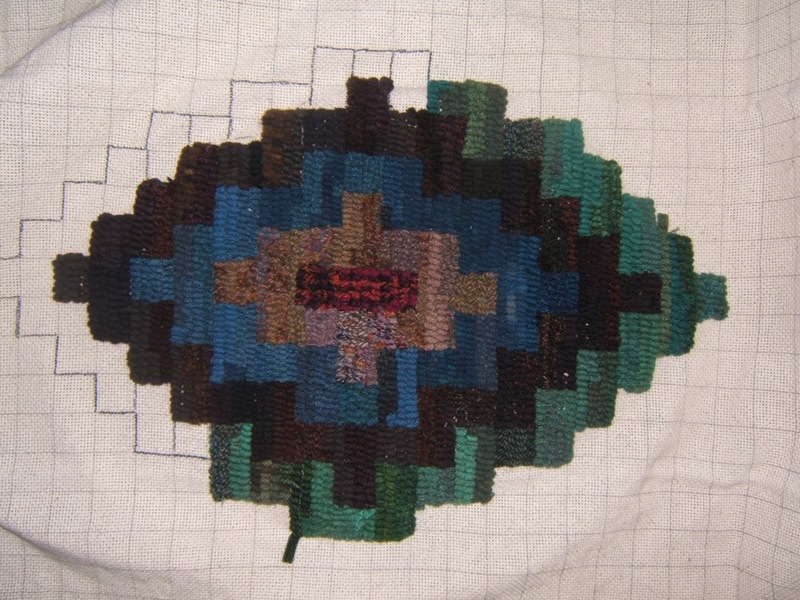 Several people weren’t at the meeting Tuesday, who had attended the workshop, but I managed to take pictures of those who were there.There were three examples of the pattern “Aztec”. 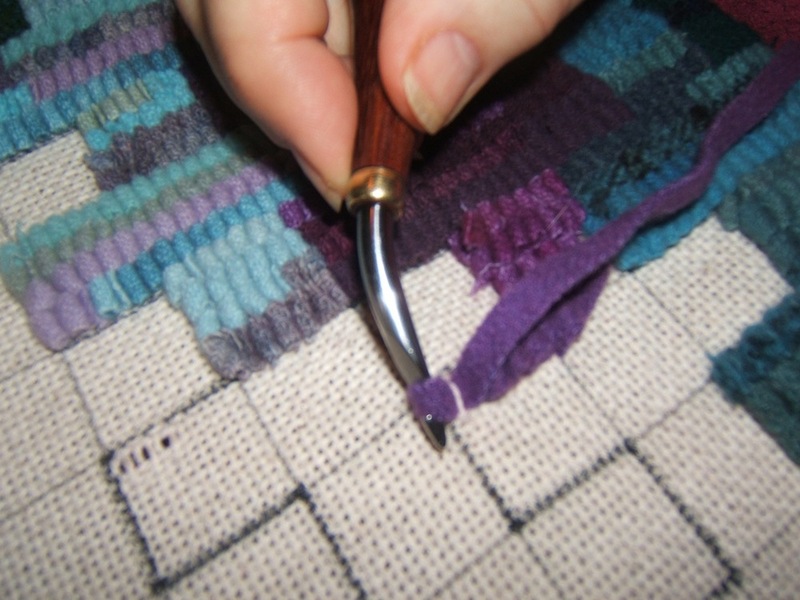 Jen stressed that it was important not to work on the pattern in such a way as to leave gaps that needed to be filled in….so those doing this pattern start in the middle and work outwards. 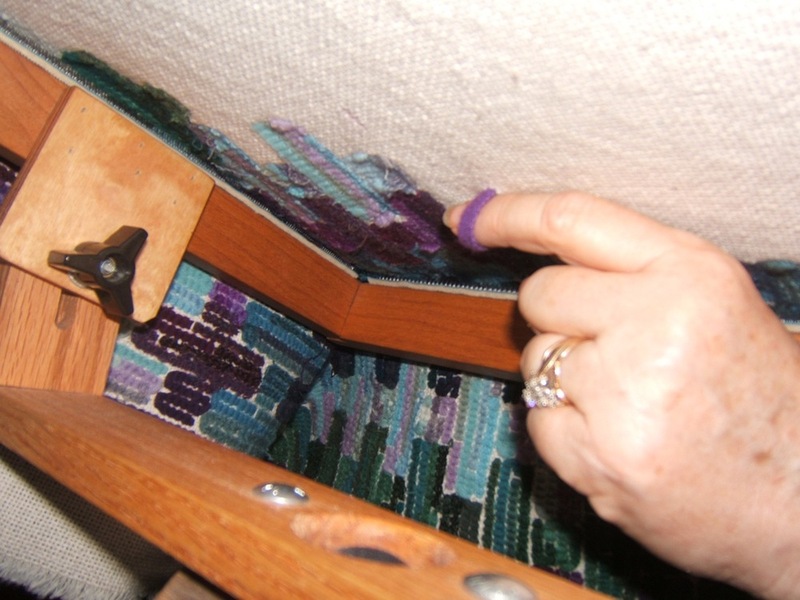 Pat found that by changing to a larger hook shank, it was easier on her wrist. i love her subtle dark pallette. 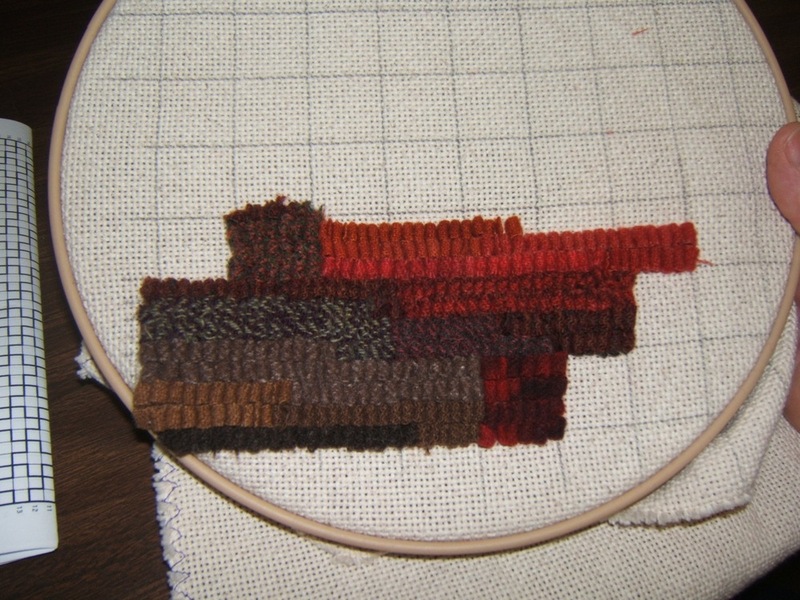 Jean wasn’t pleased with her centre block, but I can’t wait to see more of that colour as she works outward…I think it will be striking . Love the fall colours. 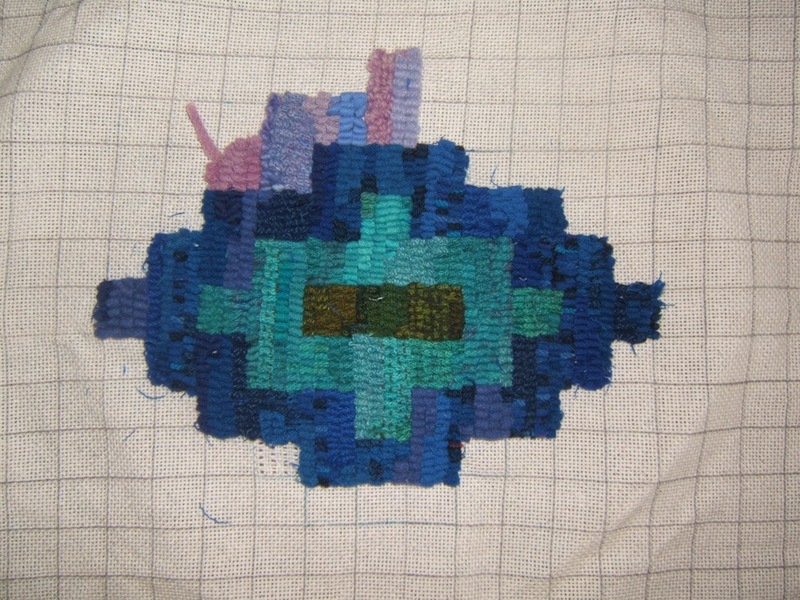 Cheri”s vivid colours really catch my eye…What a beautiful blue. 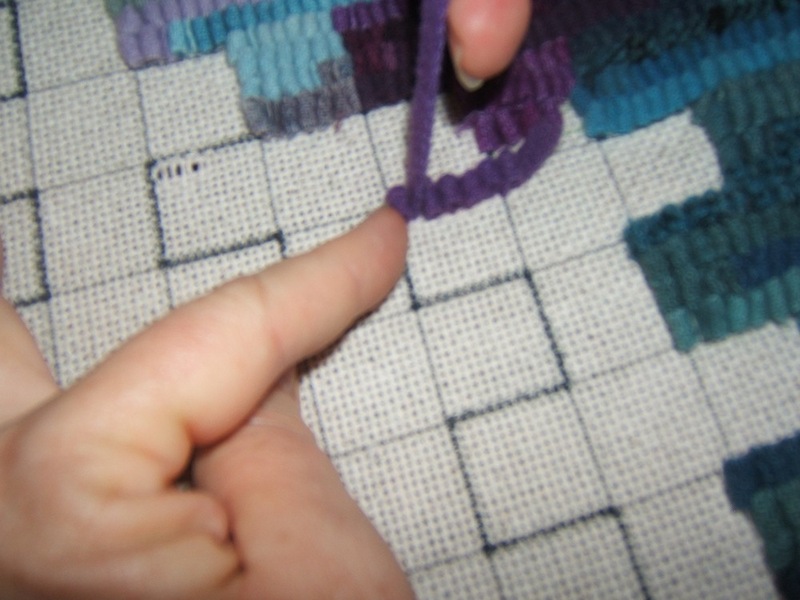 Edie, Wendy, and Darlene chose the pattern “simple” which is all about squares. 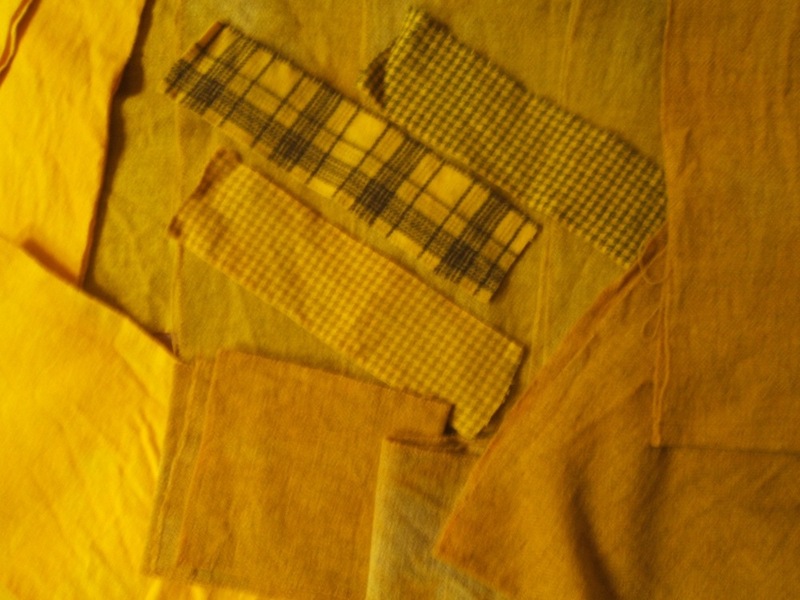 Wendy wasn’t sure she was going to like the yellow square she was just starting. 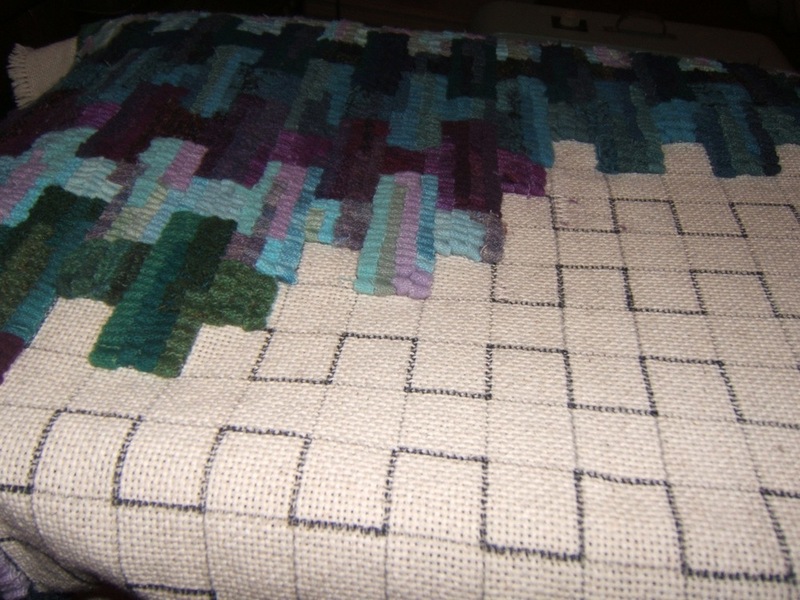 Darlene chose a small mat and is nearly finished. 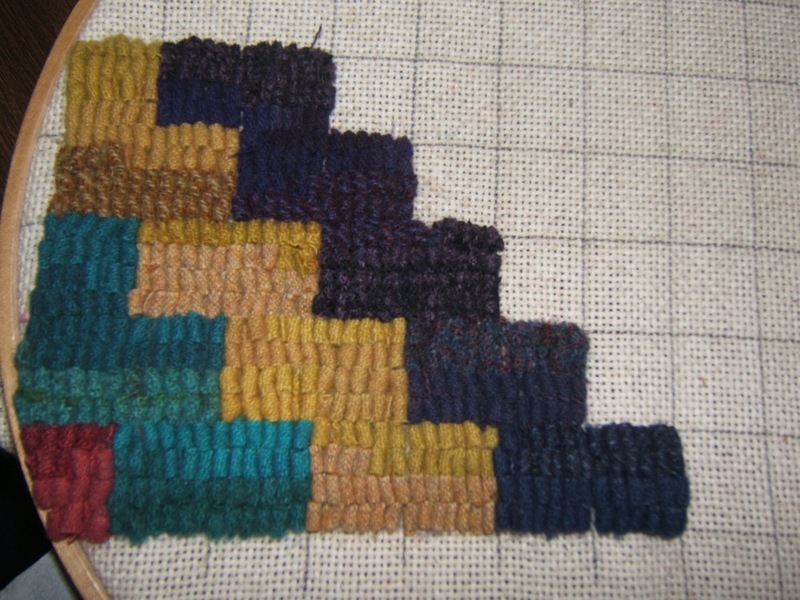 Diane is the only one doing this stair step style pattern called stripes. I think it will be quite dramatic. 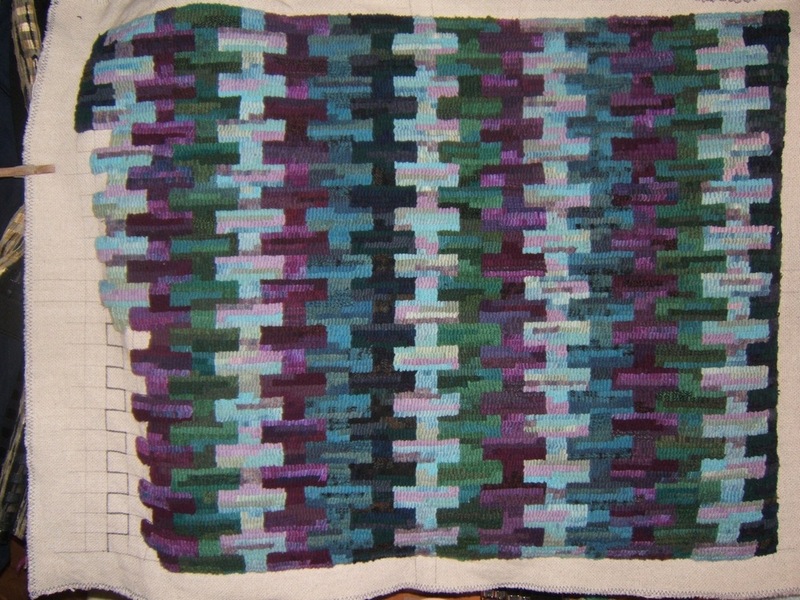 Karen chose the pattern called “flying geese”. Love those colours! 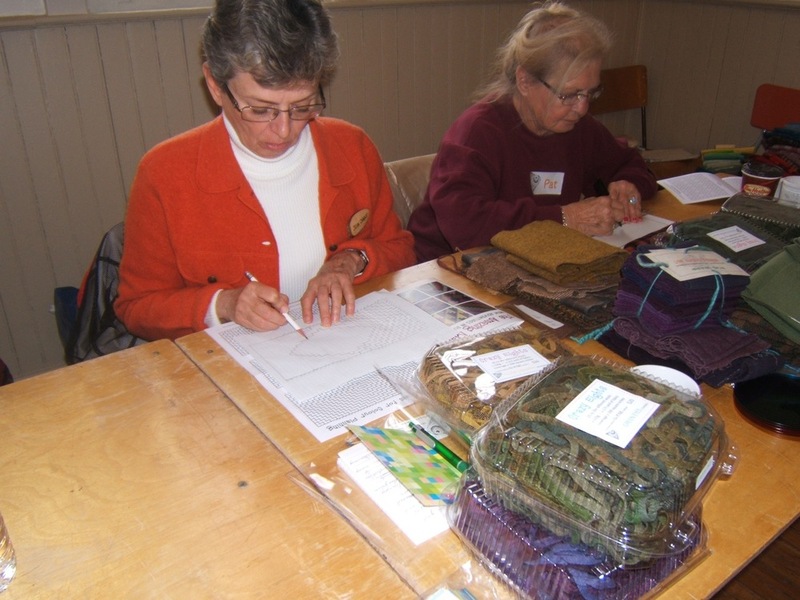 What a great time I had on Friday and Saturday at the Matrix workshop with Jennifer Manuell. 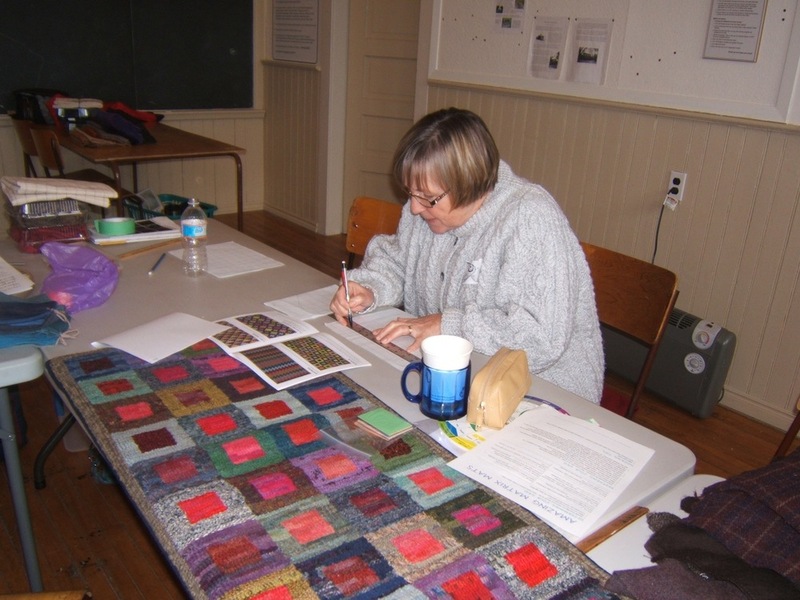 It was held at a converted old one room school house, in a beautiful country setting….. a wonderful place for a workshop, with the exception that the furnace wasn’t working, and it was very cool. (that was our president’s warning word)….actually….it was FREEZING!!! I didn’t check my email before I left friday morning, so I missed the warning …and naively arrived in sandals and bare feet, while others had heavy jackets or sweaters, and multi layers. Many people brought heaters, so by afternoon, (when I took these pictures) we were quite comfortable. 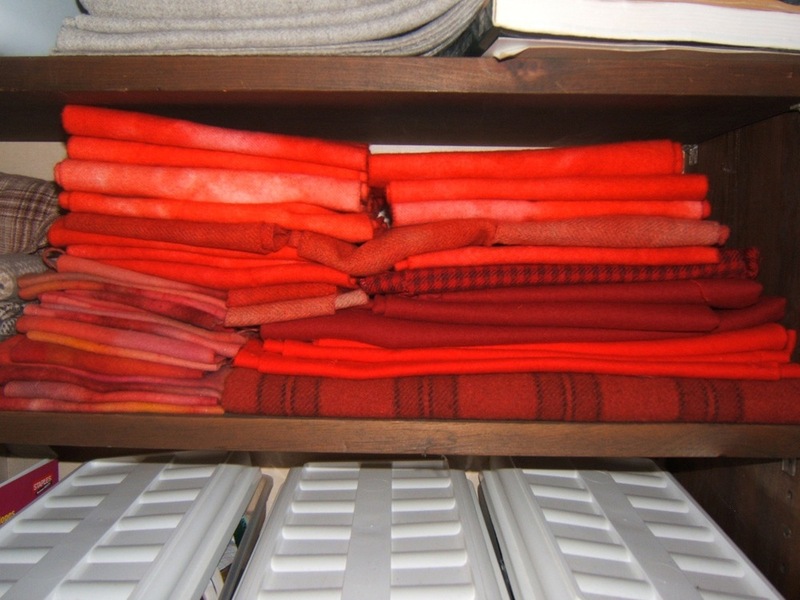 Friday was spent working with colours,and choosing our wools, patterns and colour placement. Everyone brought wool from her own stash, and added as necessary from the yummy wool brought by Jennifer. 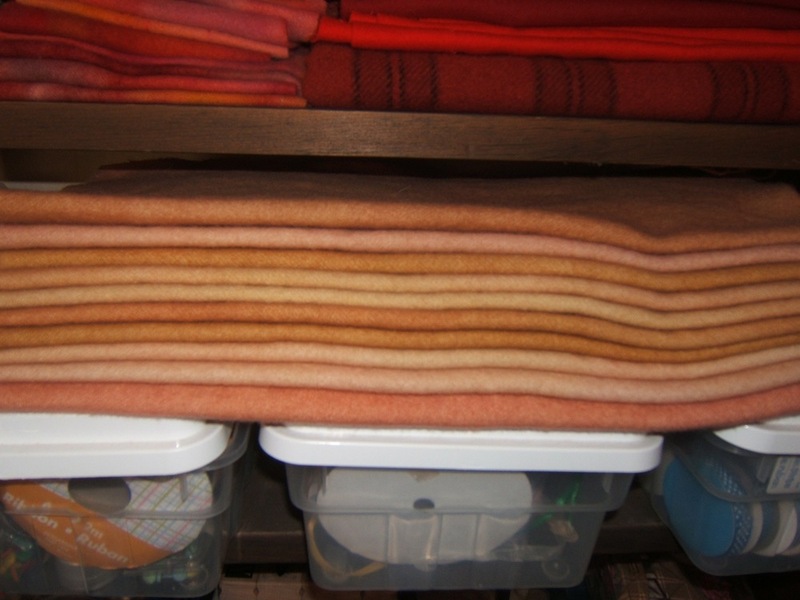 Diane had a huge pile of wools selected from Jennifer’s, but said they were so beautiful, she couldn’t make up her mind which ones to keep. So is Linda. 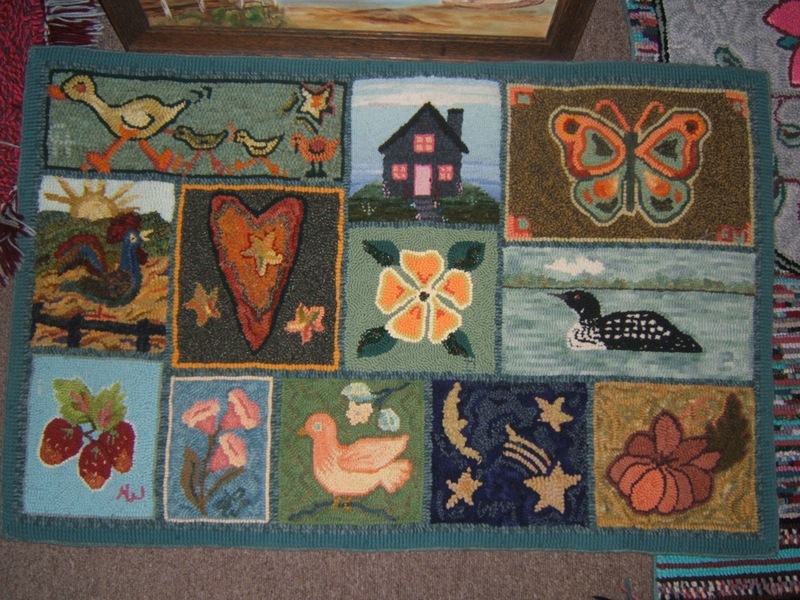 The rug in front of her (done by Jennifer’s mom) is the pattern she’s chosen. 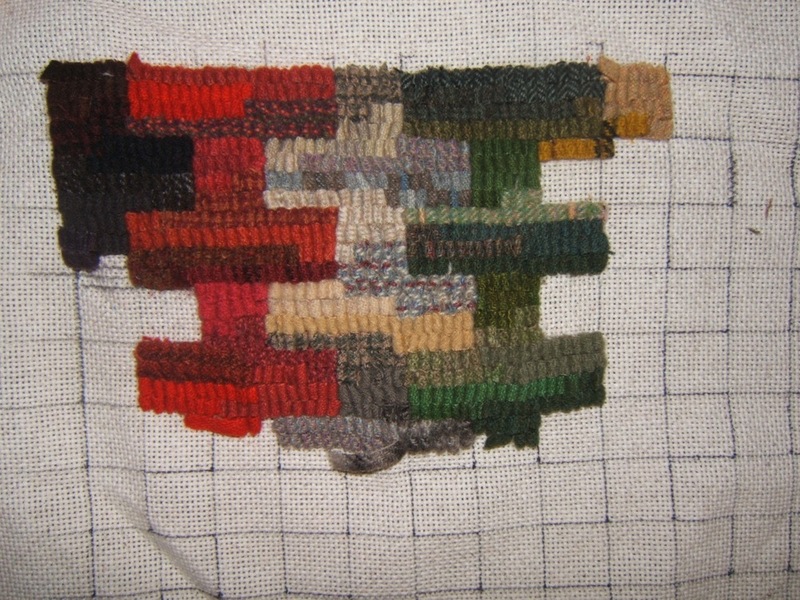 It’s called ‘simple’, but requires the largest number of colour families, and is the trickiest for colour placement. Cheri is well known for her love of acid green and turquoises…and sure enough…look at her colours! 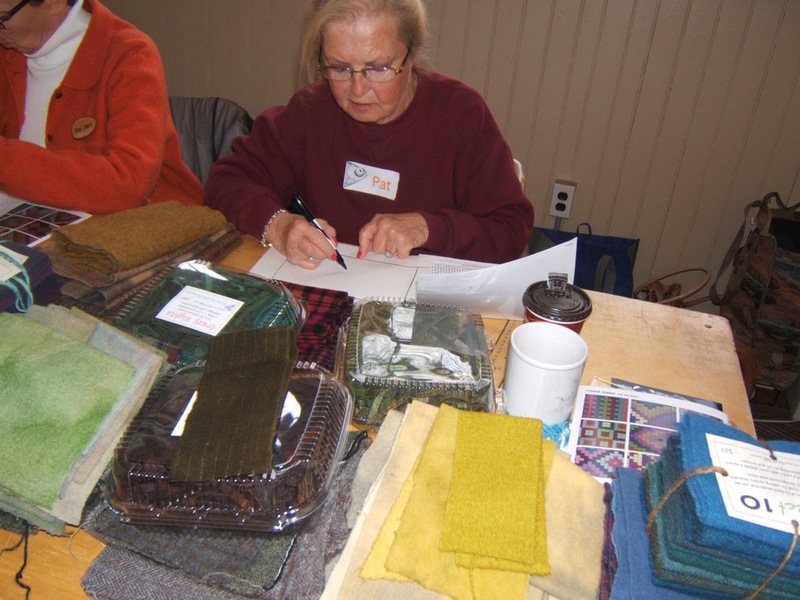 Isabel is working on her pattern, while Darlene reads Jennifer’s Matrix booklet….which is crammed full of information on all aspects of hooking her matrix rugs. 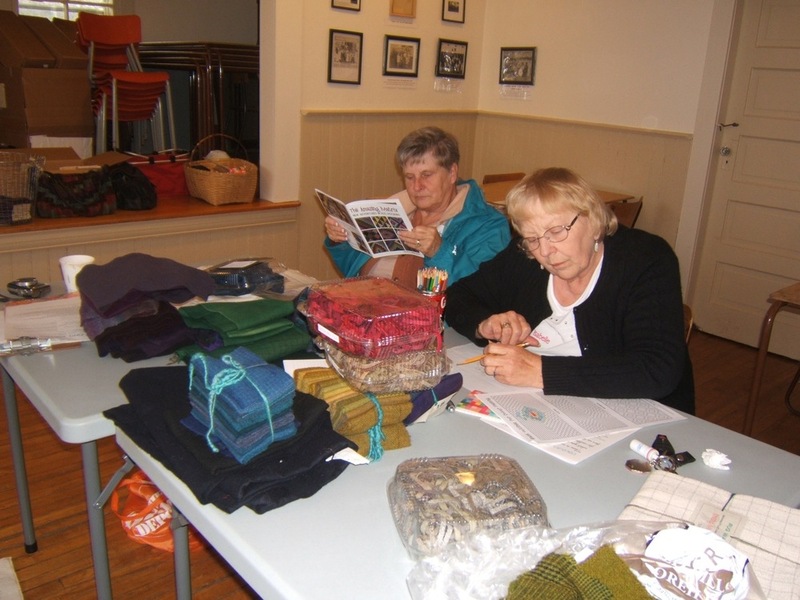 Jennifer (on the left) constantly helped everyone with colour choices. 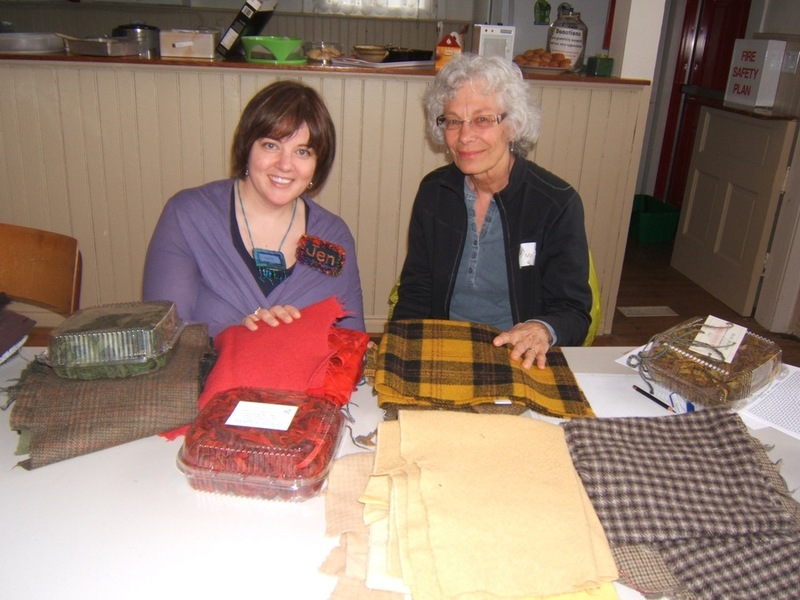 Here she is with Margaret…who wanted a red colour group in her rug so it would go with her kettle! 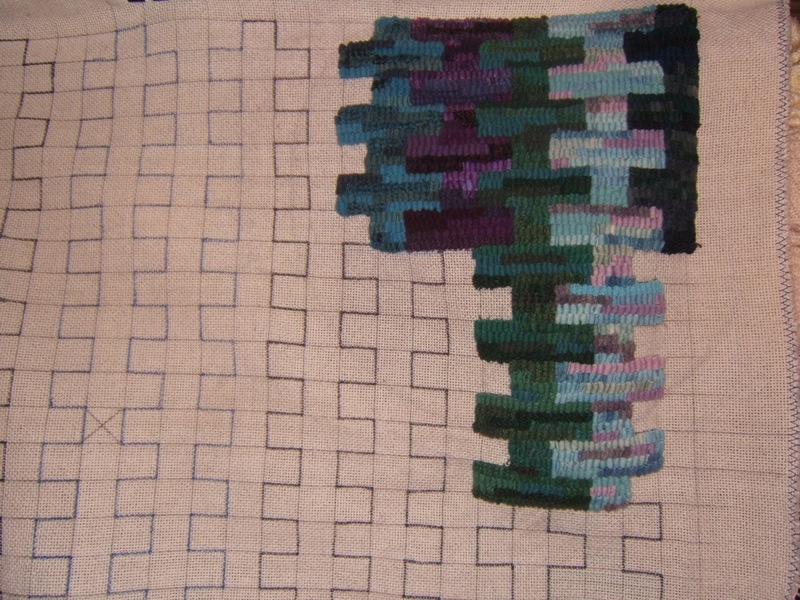 I chose a pattern called zippers, and decided on using 5 colour families. The name becomes obvious when you see the pattern laid out. This is my purple/plum group. 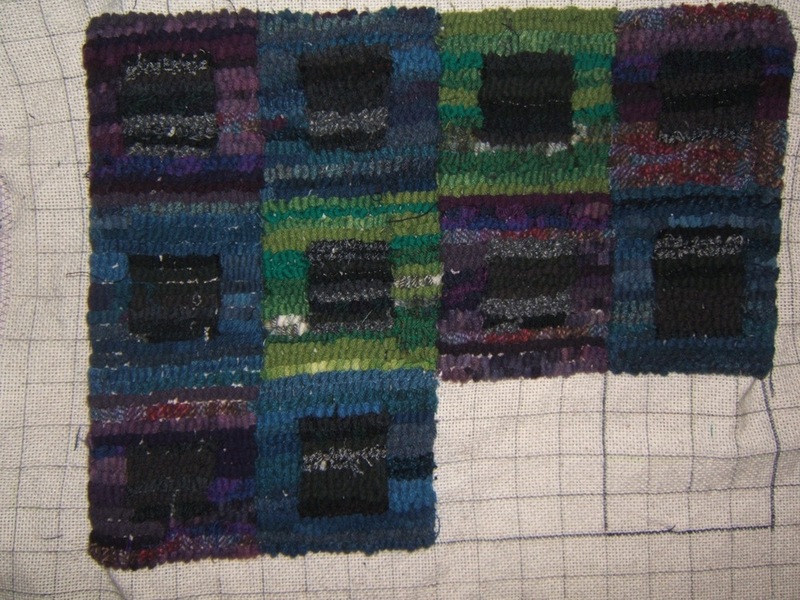 I felt I didn’t have enough variety, so I chose Jennifer’s “purple rain” collection (top left) to add to my wool. 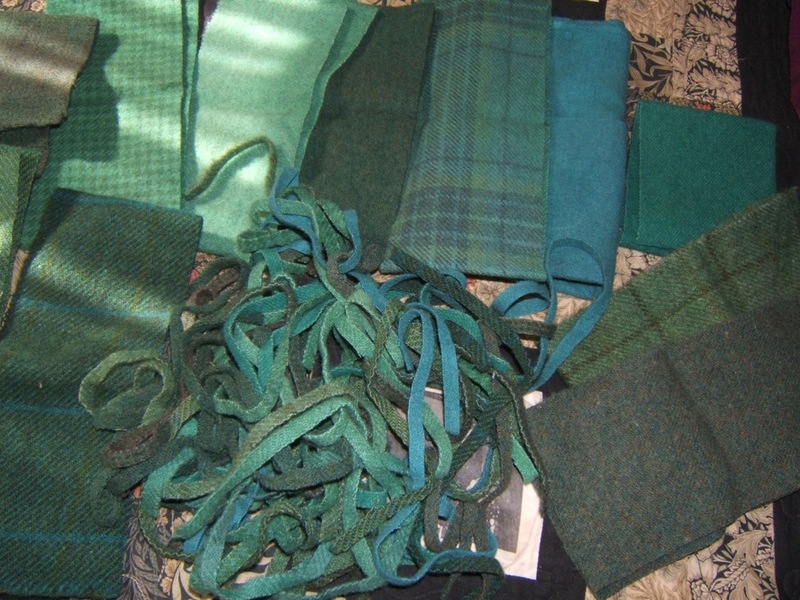 This family of greens consists of a bundle of 10 different wools purchased from Jennifer, plus just one of my own. This is my dark group…although with the flash they aren’t nearly as dark looking as they actually are…they hook up looking quite black. This is my blue family. 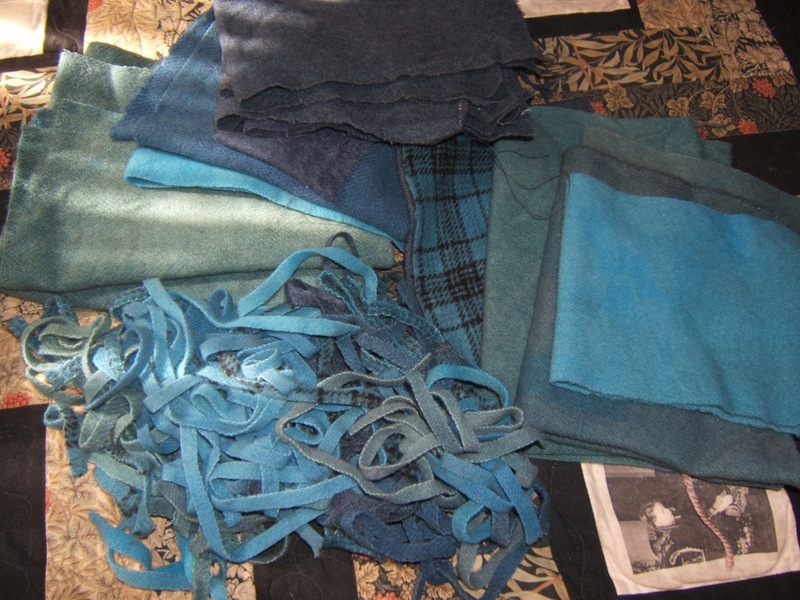 I didn’t like how many different blues they had originally, so on Friday night, I overdyed them all with a turquoise blue to create a more related group. 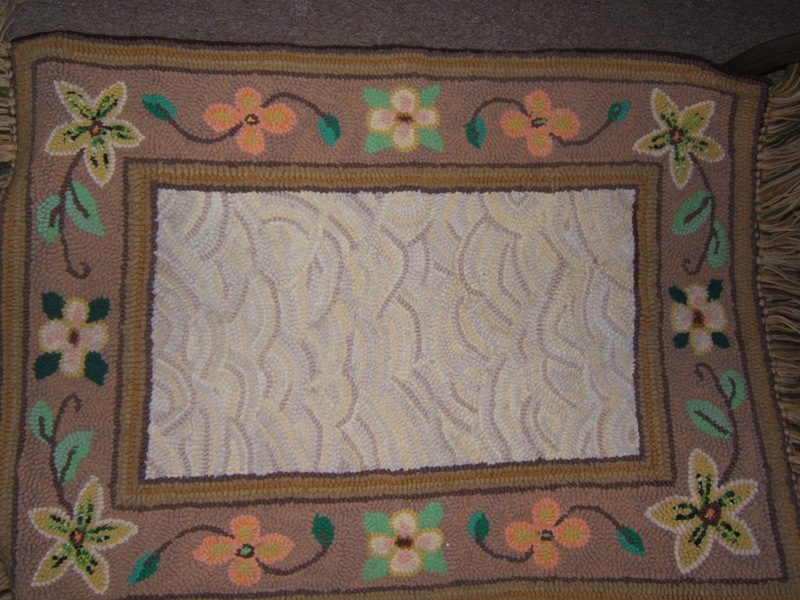 My other major faux pas (besides wearing sandals), was that I left my camera sitting at home on Saturday, so have no pictures of the actual rugs as they got going (other than my own) ! I’m sure most of them will be at our hooking meeting on Tuesday, so I’ll take photos of them then. The first Tuesday of the month is our tribute day, and it’s becoming my favourite meeting of the month. How wonderful to get to see and hear about the amazing background of the women in our group. DorisGraham recently celebrated her 90th birthday, is now wheel chair bound, but still comes out to most meetings. Through the course of her hooking career, she worked in a wide variety of styles. This Elizabethan style vase is delicately shaded. 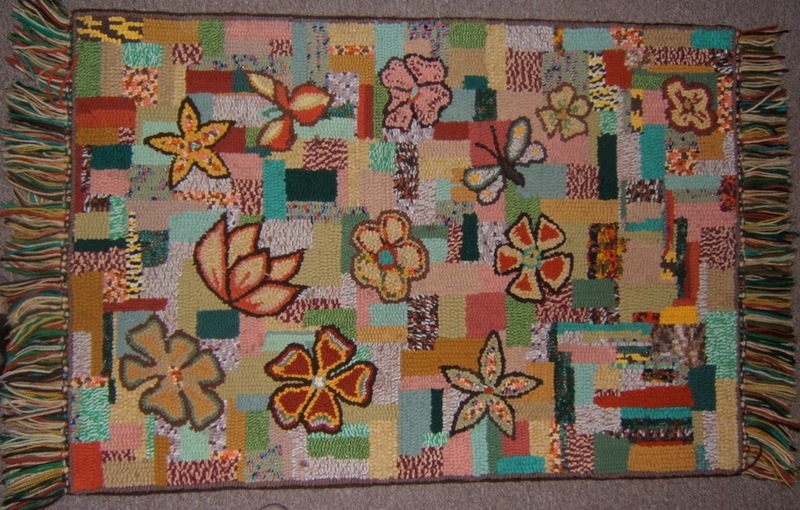 There were also examples of fine Wadoboro sculptured mushrooms from the 1970’s (sorry…I didn’t get a picture) Doris eventually settled on a preference for hooking with t-shirts,and all of the following rugs are done that way. She is well known for her wonderful crocheted edges and fringes. 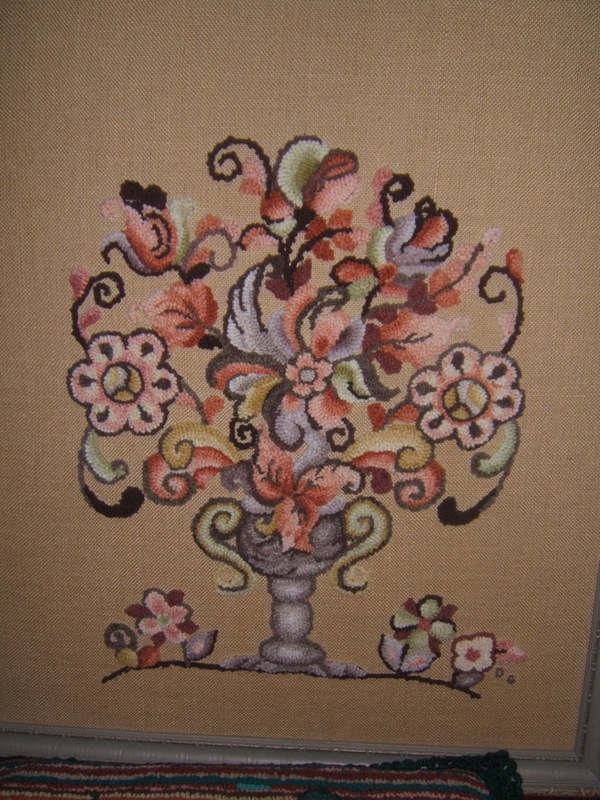 This primitive pictorial has a lovely crocheted scalloped edging. 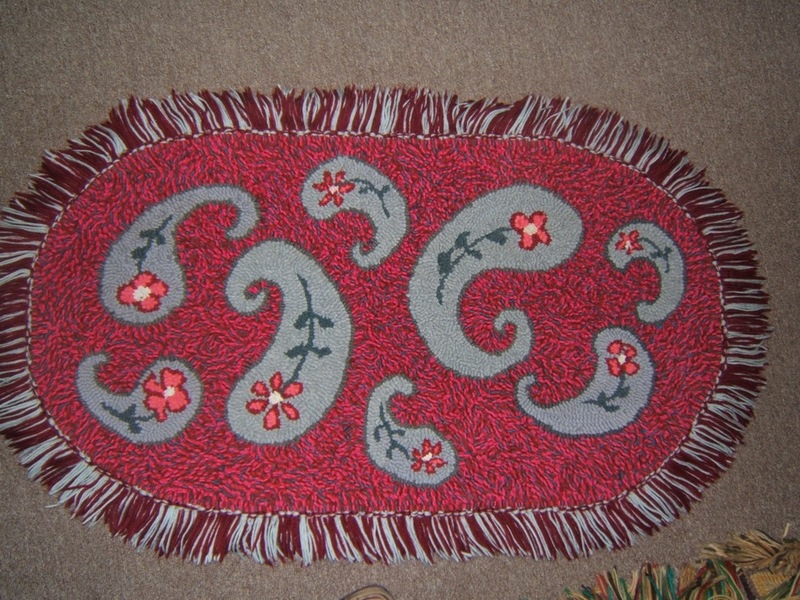 This paisley style rug is fringed all the way round. 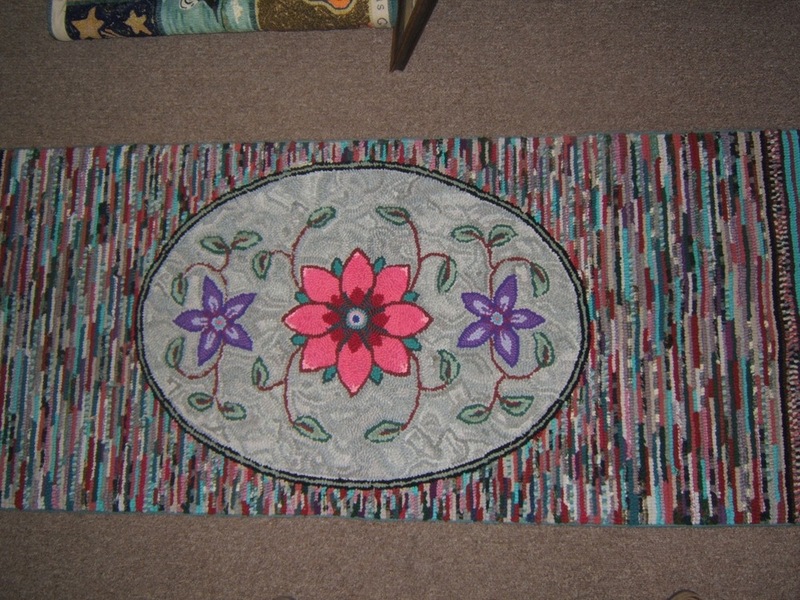 The shading in the centre of this rug is so effective, that I thought it was sculptured. A very effective hall runner done with hit and miss. 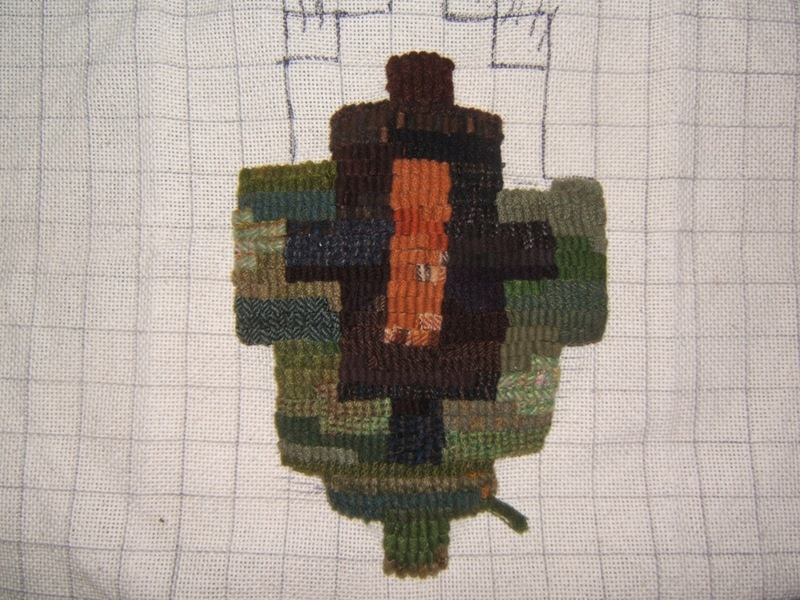 This is my favourite of the samples of her work brought to the meeting by her daughter Diane. It makes me smile just to look at it. 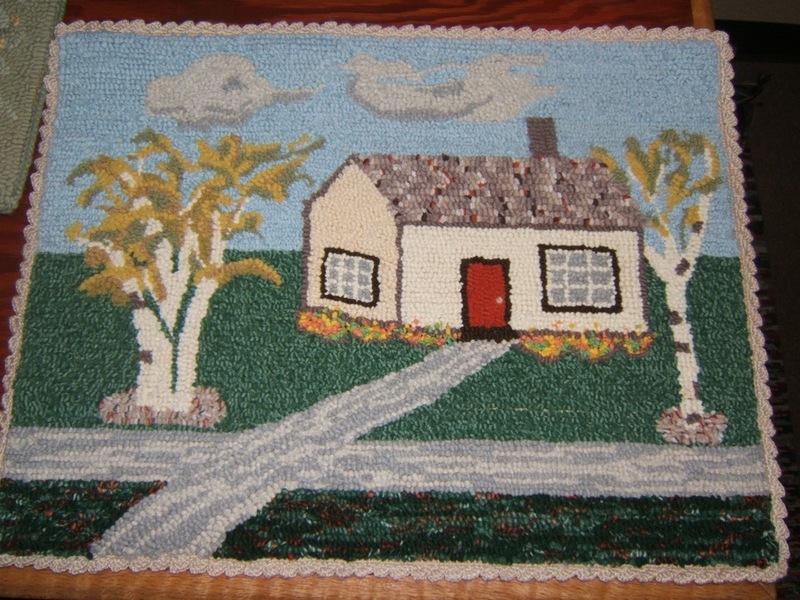 Like so many talented women, Doris didn’t work exclusively with rug hooking but also did quilting, tatting crocheting, knitting, and painting. 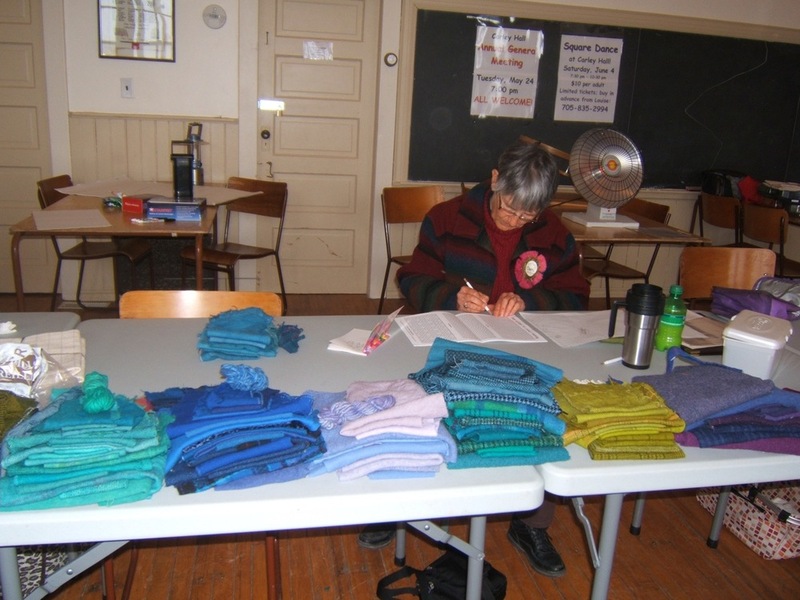 She is very busy now knitting scarves which she donates to the Salvation Army at Christmas. (She is also adept at saying the alphabet backwards.) 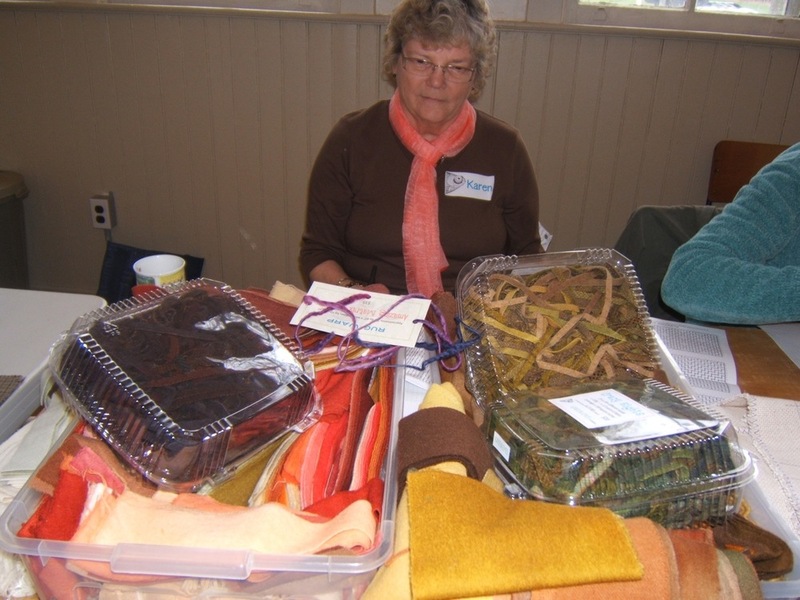 Thanks Doris for sharing with us a small sample of your wonderful work.